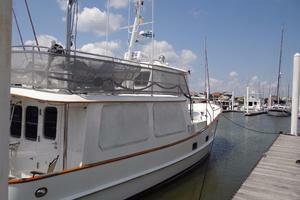 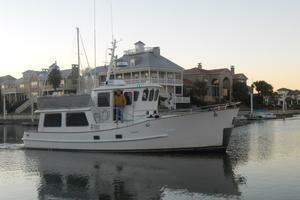 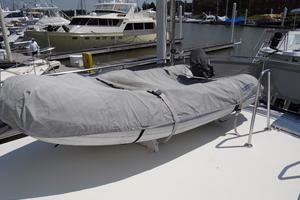 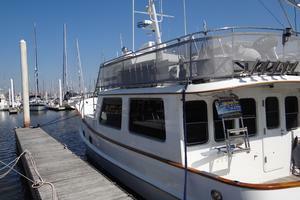 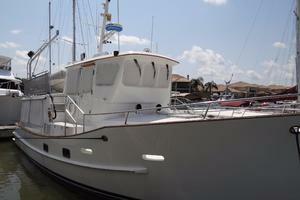 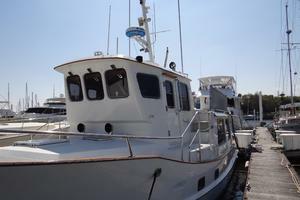 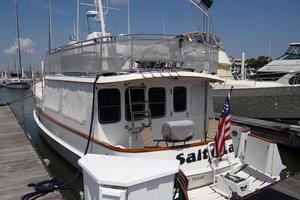 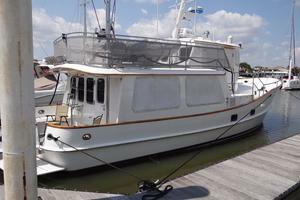 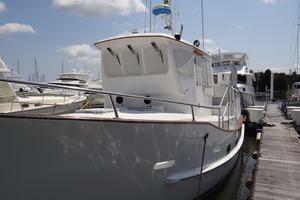 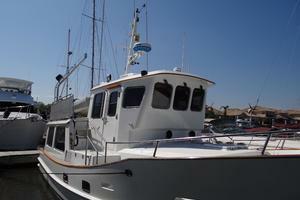 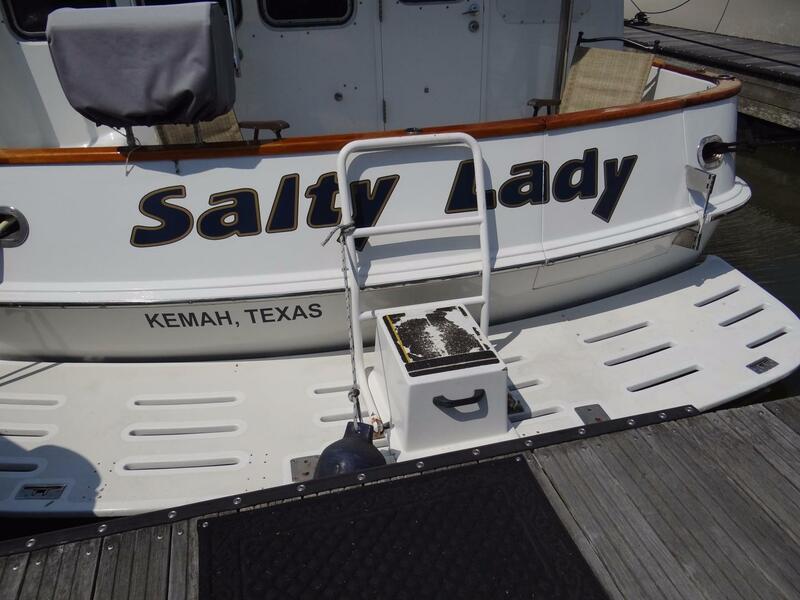 Salty Lady is one of those special boats that are rarely found for sale. 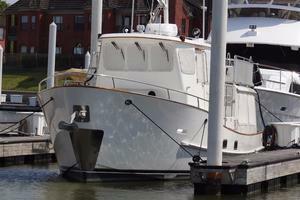 It’s even more difficult to find one with twin engines! 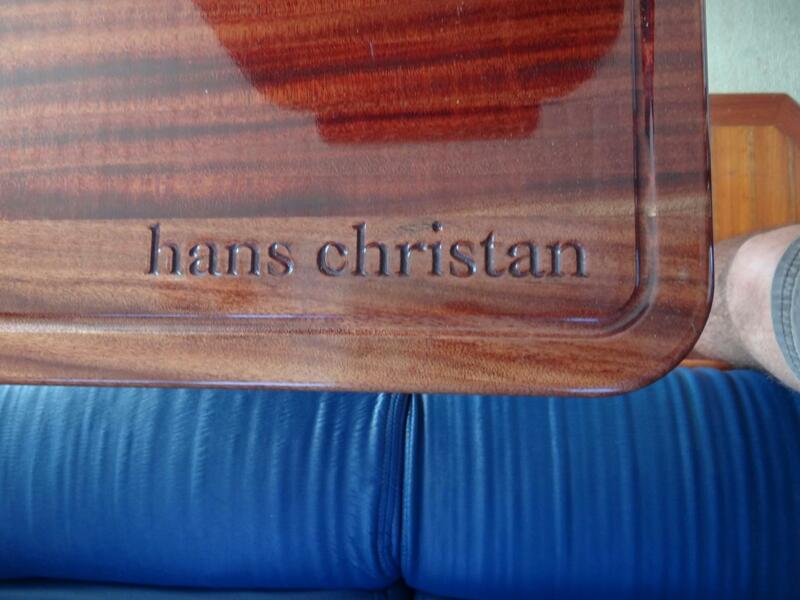 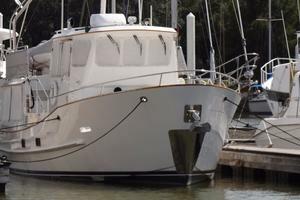 This 1990 Independence 45 is one of only 18 built by Hans Christian in Taiwan before moving production in 1996 to the U.S. builder, Cherubini. 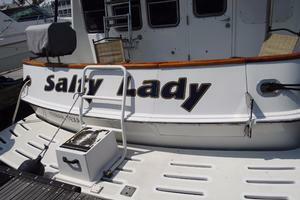 Salty Lady is a sturdy raised pilothouse trawler intended for those who take their cruising seriously. 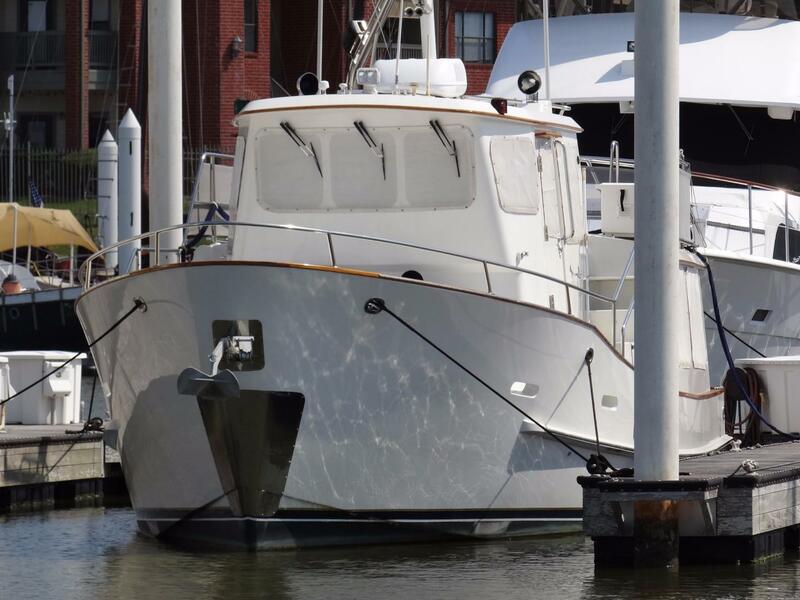 Designed by James Backus and Gary Grant, she's built on a semi-displacement hull with moderate beam, hard aft chines to reduce roll (rather than rounded bilges common to most displacement designs) and a long, prop-protecting keel. 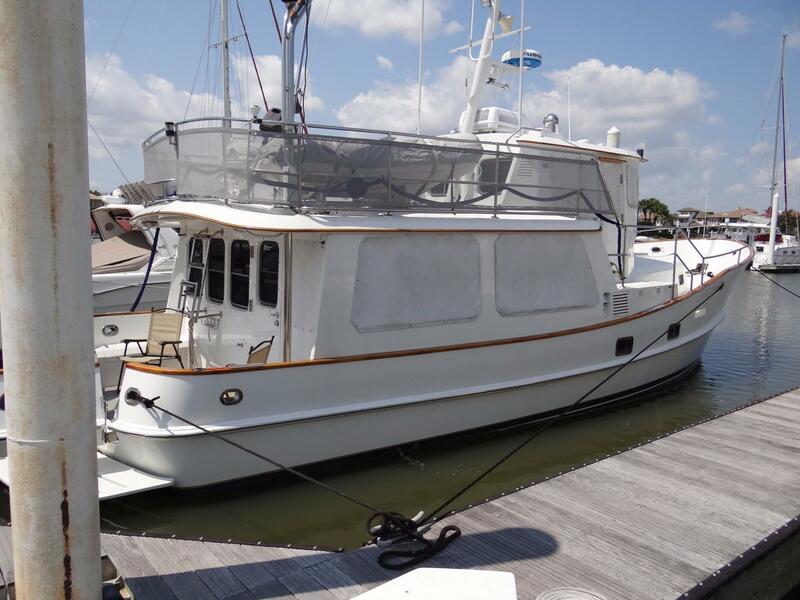 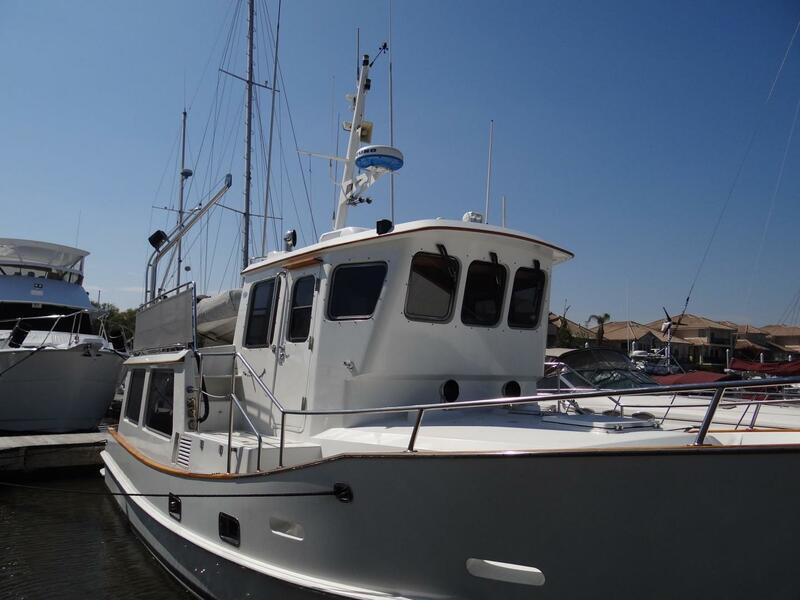 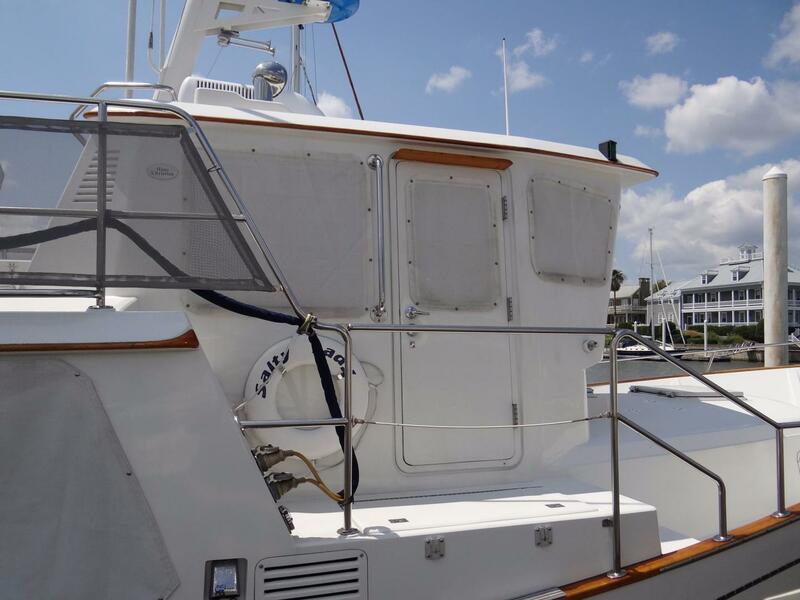 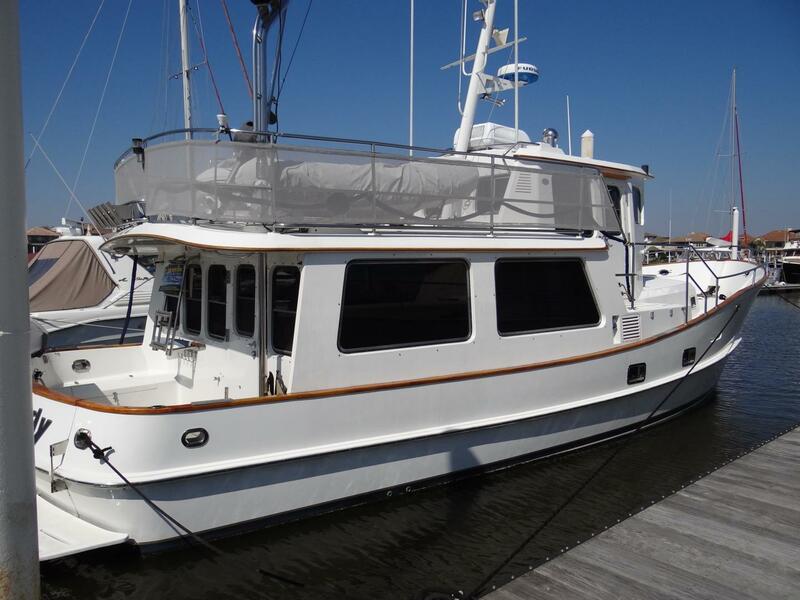 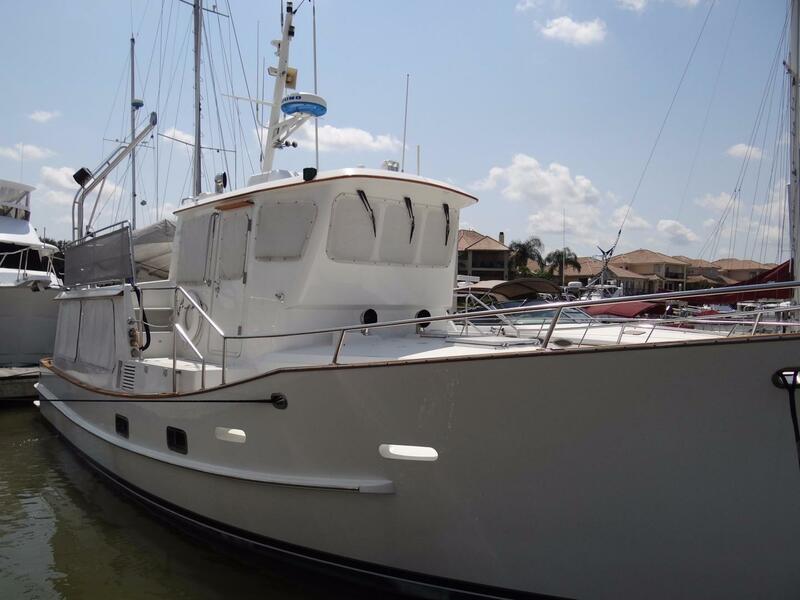 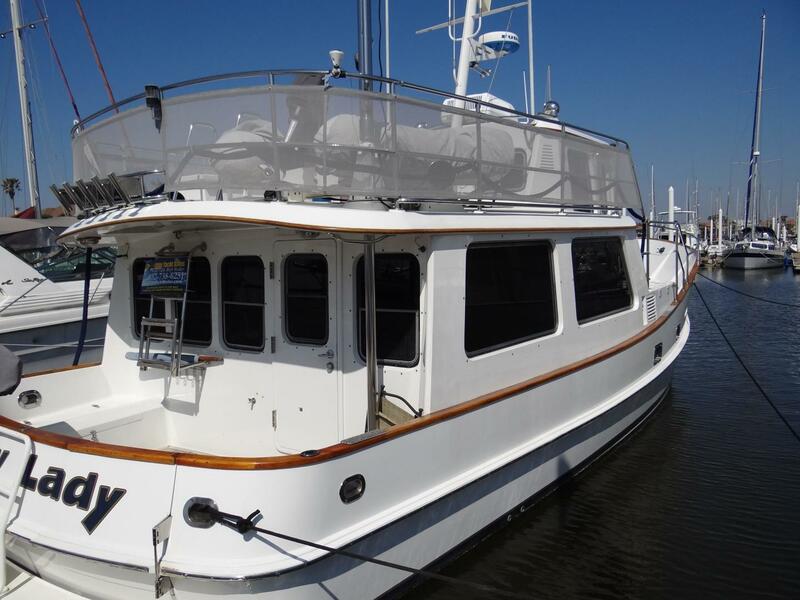 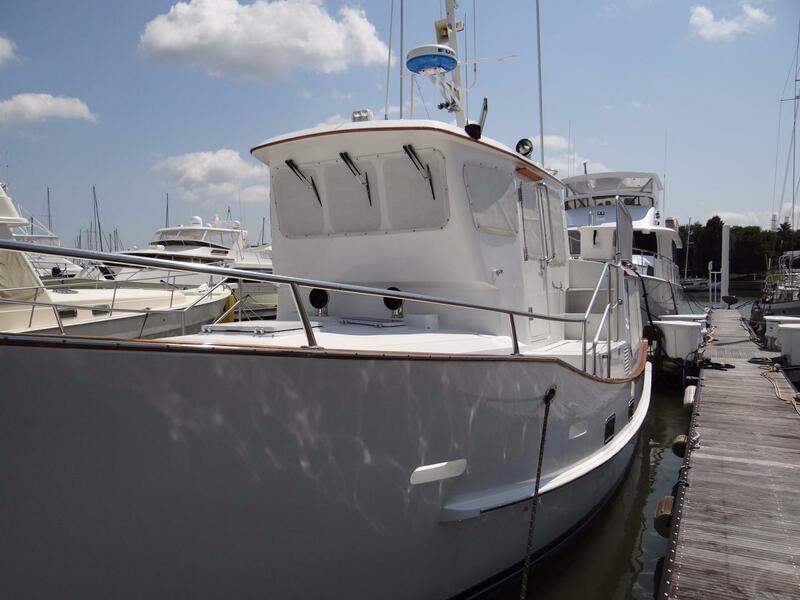 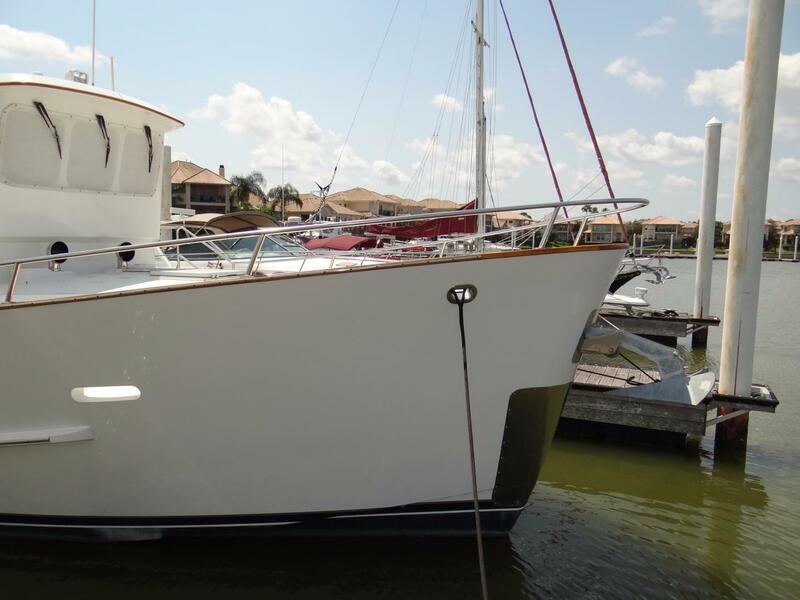 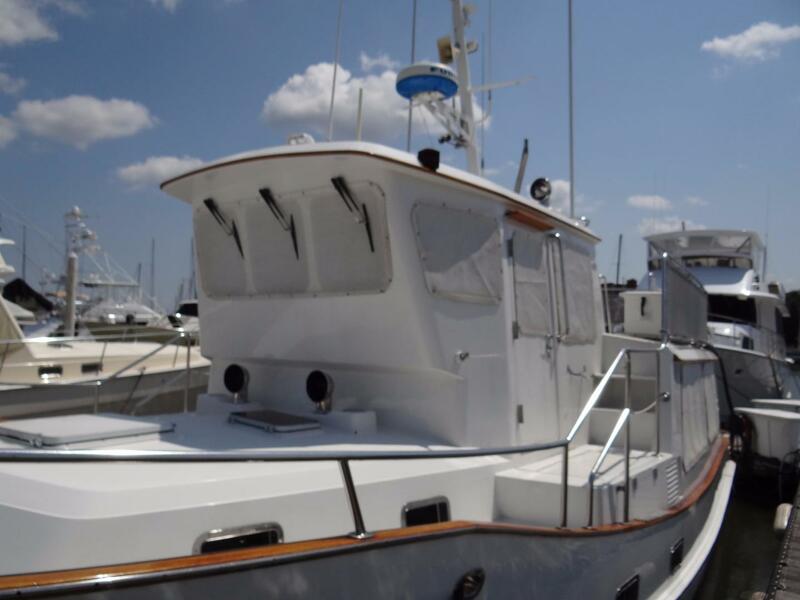 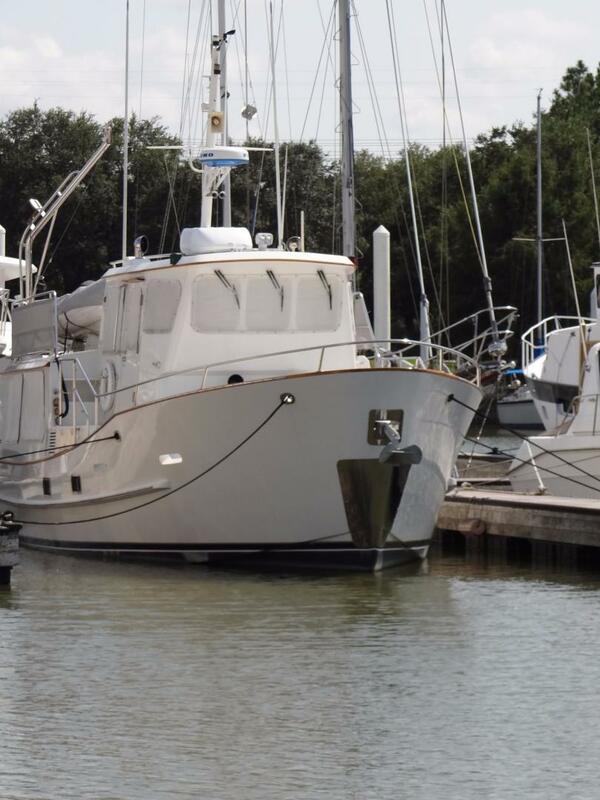 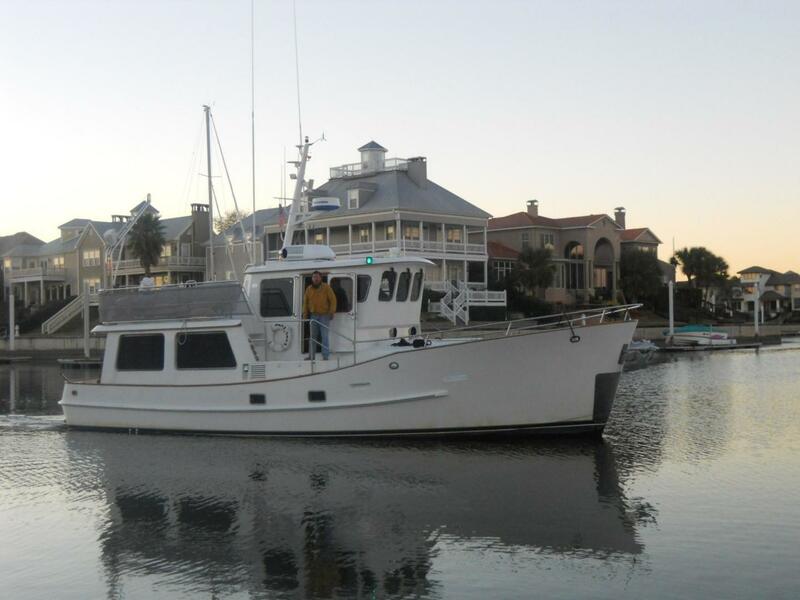 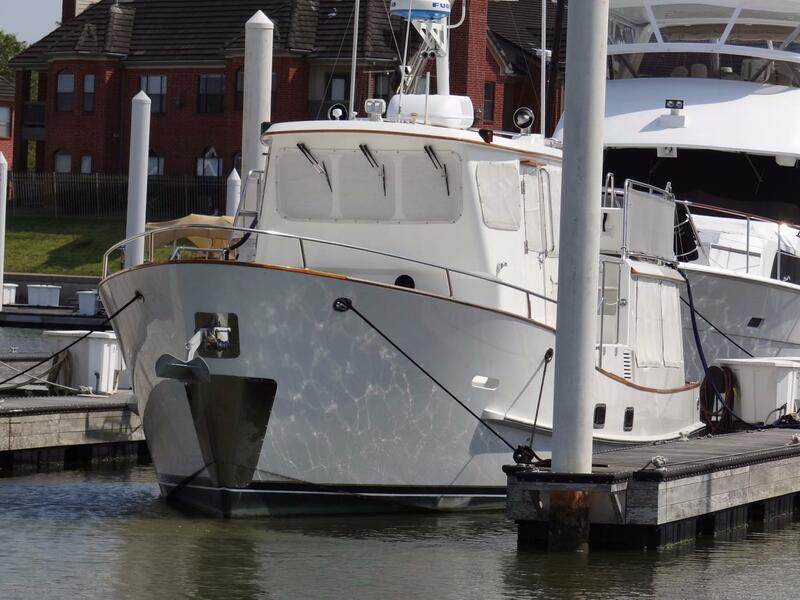 This well-maintained trawler is powered by dependable twin Ford Lehman diesels that offer excellent maneuverability and a cruising speed of 7.5 knots at an economical 4.5 gallons per hour. 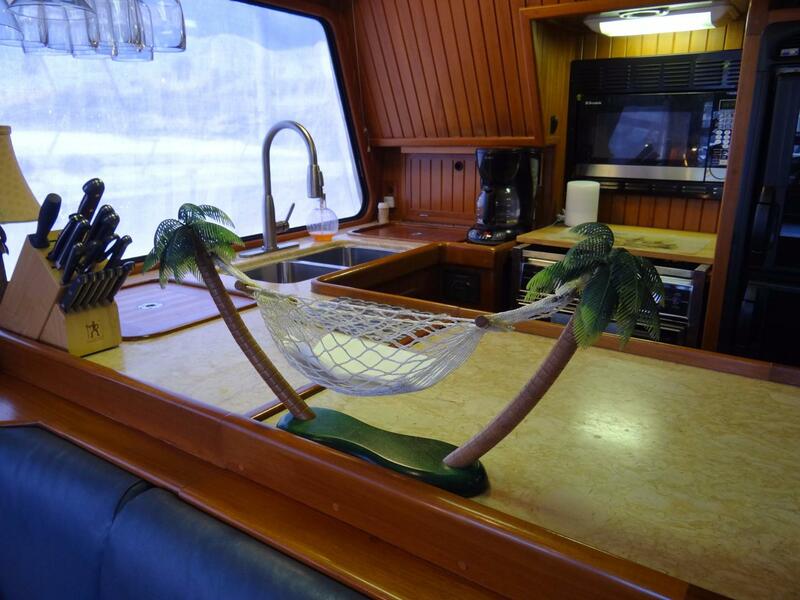 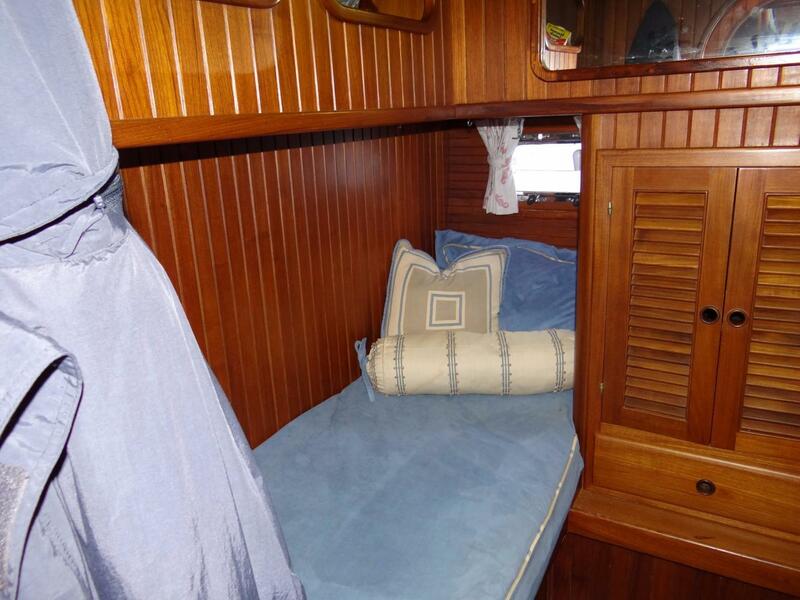 Her comfortable interior offers two spacious staterooms, two full heads, a nicely organized galley up and a large salon that opens to her covered aft deck. 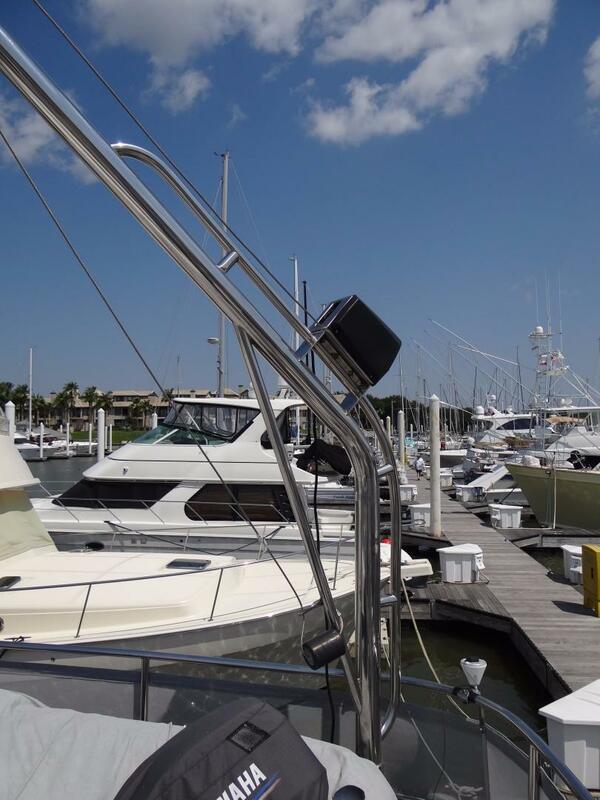 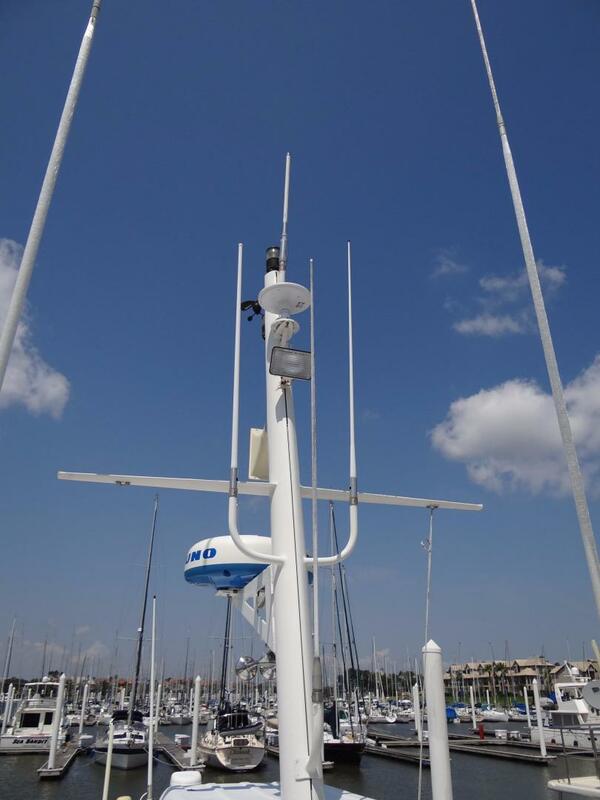 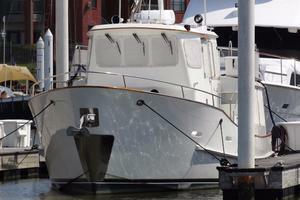 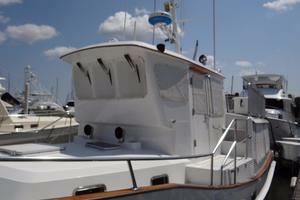 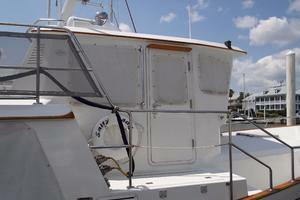 The raised pilot house has easy access to the wide port and starboard side decks, making line handling safe and easy. 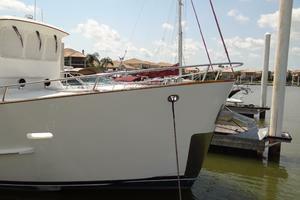 Being given the best of care by her knowledgeable owner, she is in excellent condition and awaits the change of command. 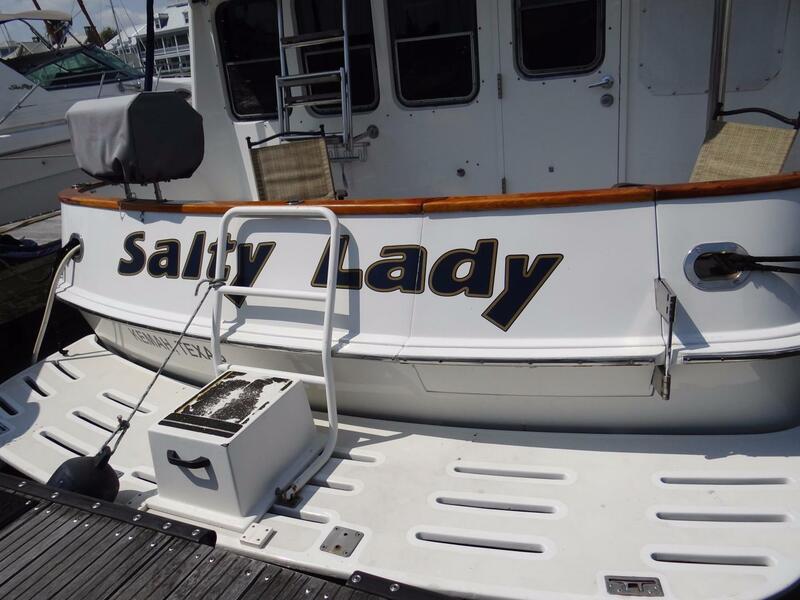 So, if you are looking for stability, comfort, economy, dependability and safety for both vessel and crew, Salty Lady is a "MUST SEE"! 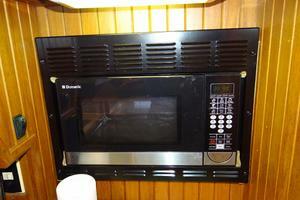 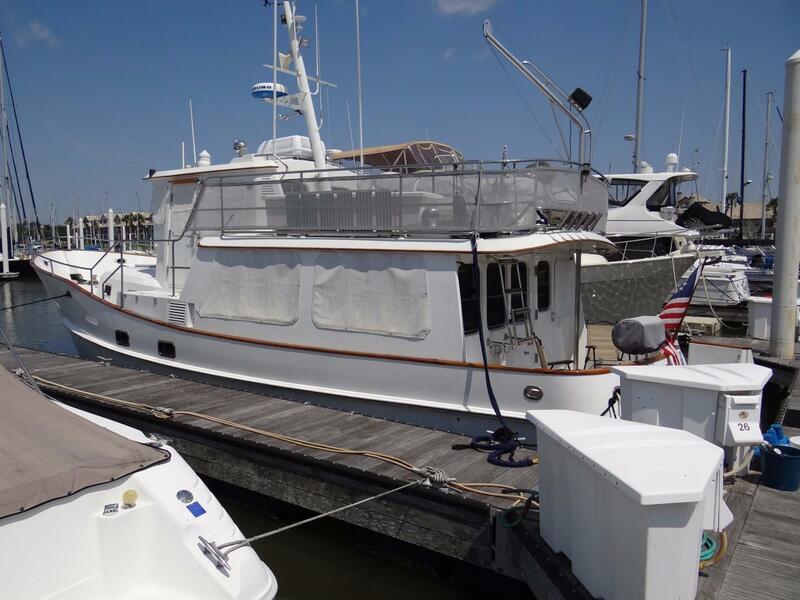 Read the full specs for more details and contact the listing broker today! 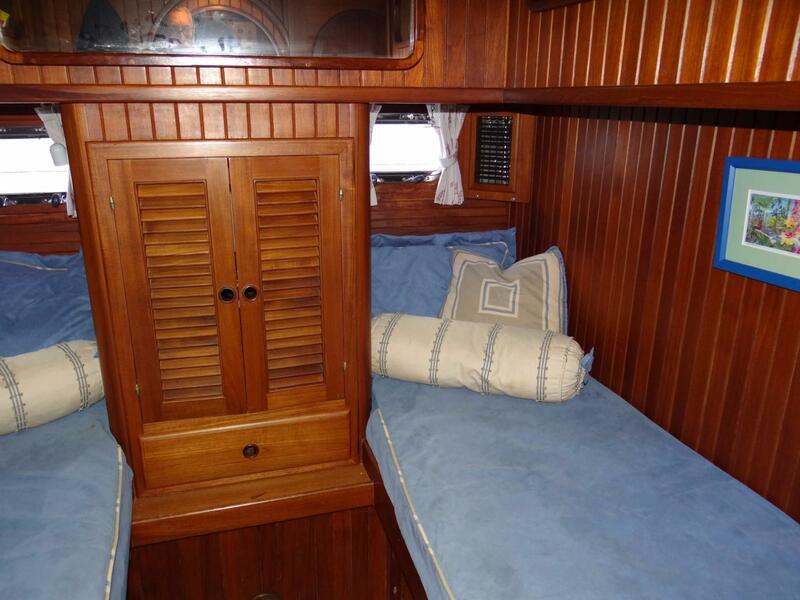 The master stateroom is forward with a centerline queen bed and ensuite head. 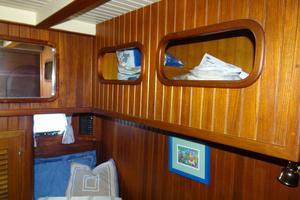 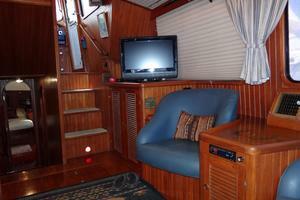 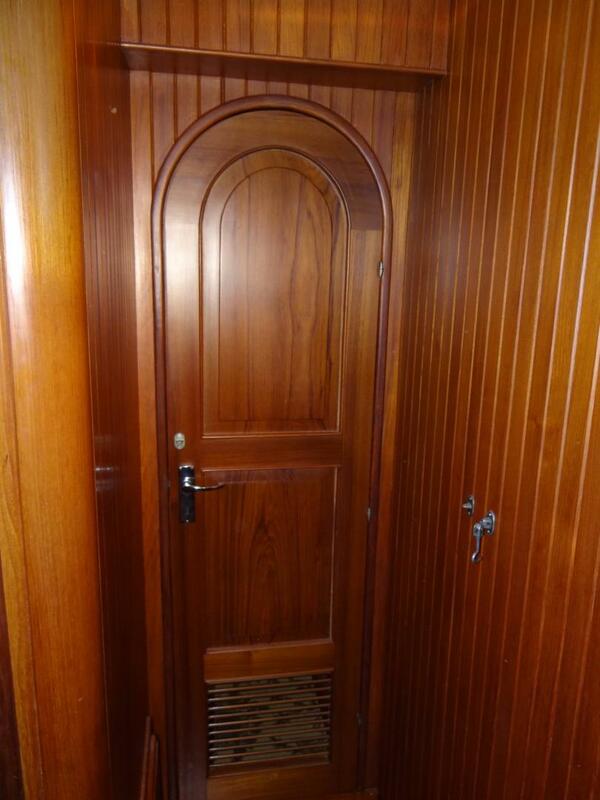 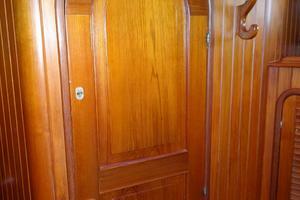 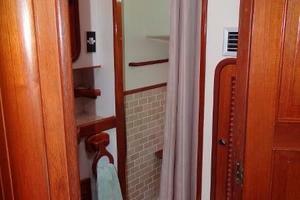 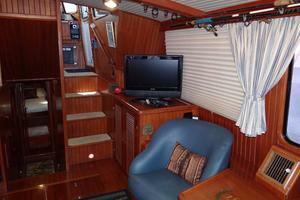 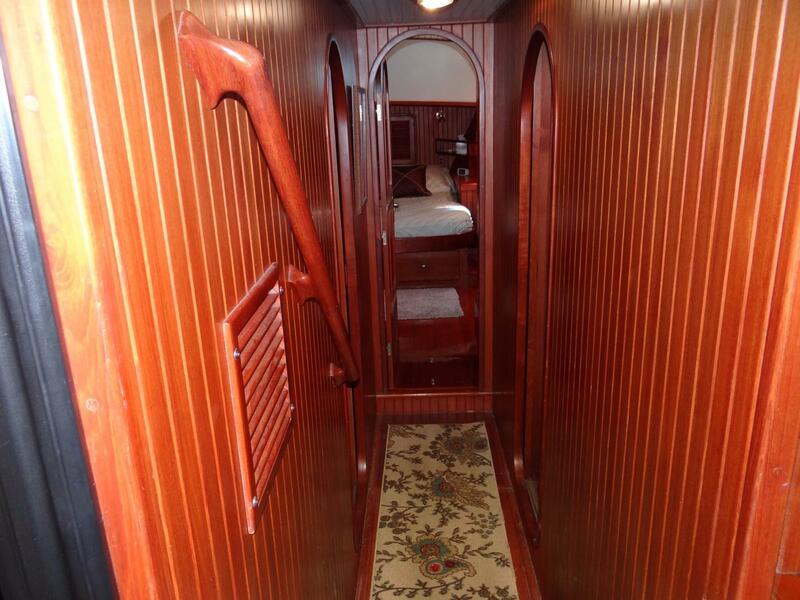 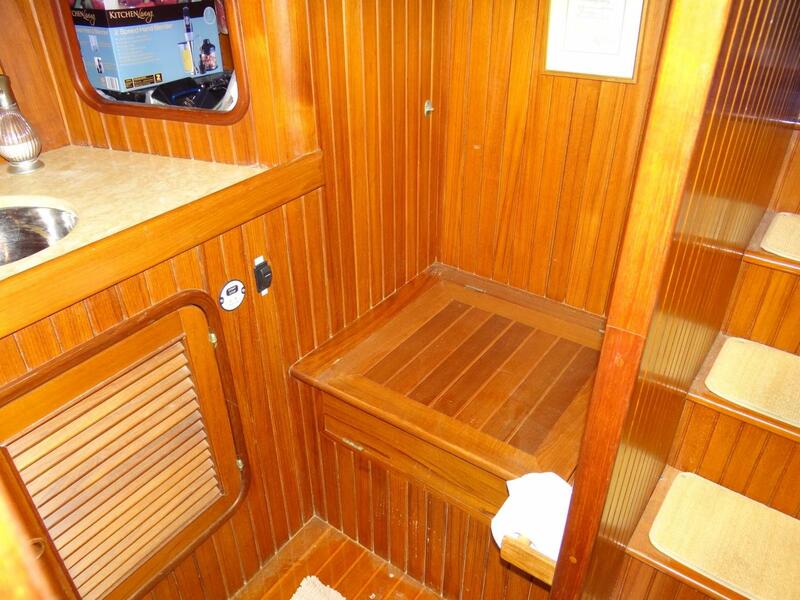 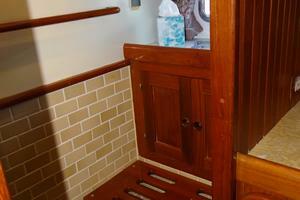 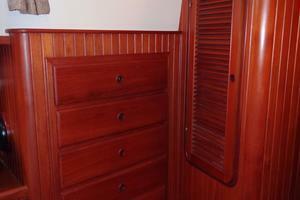 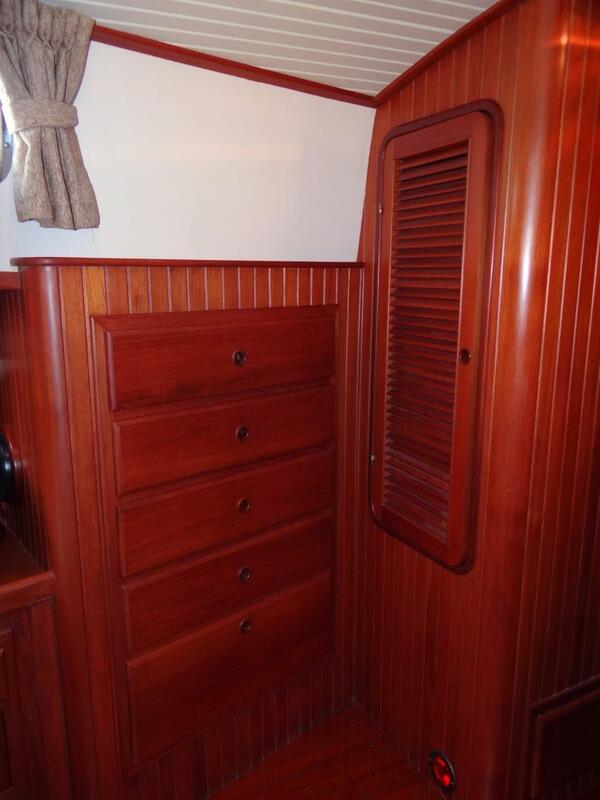 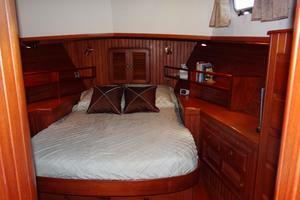 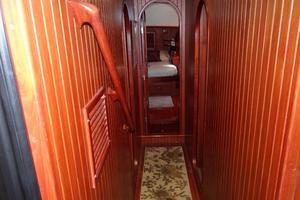 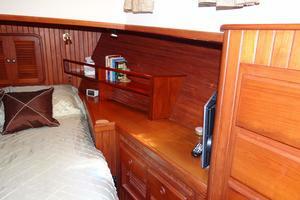 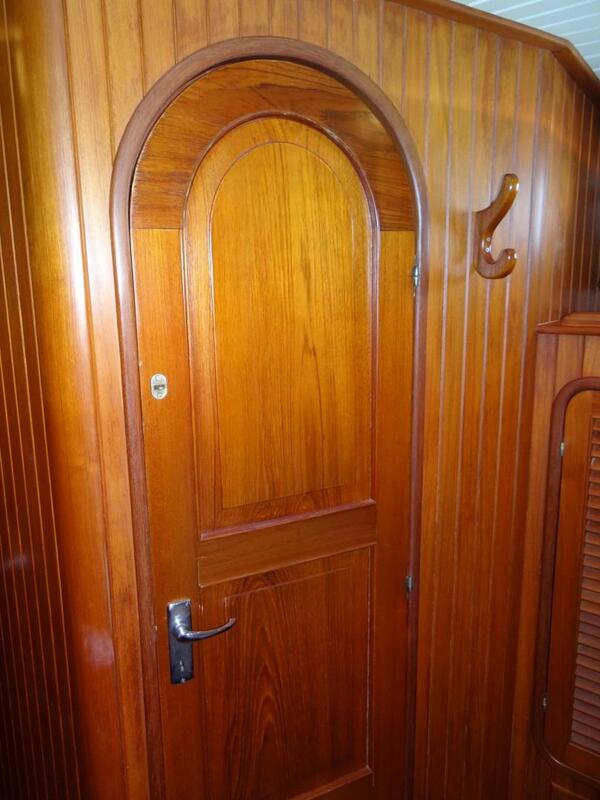 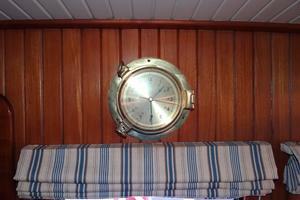 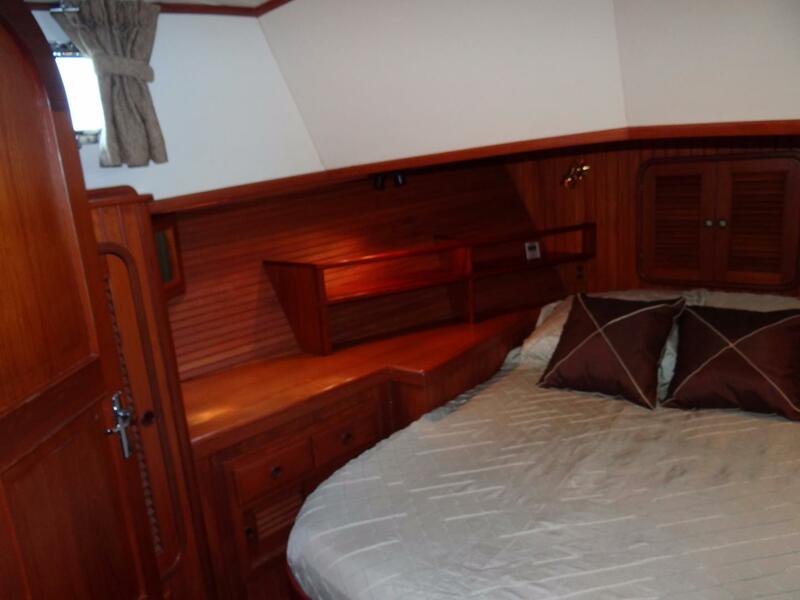 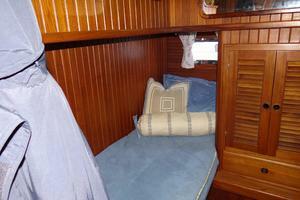 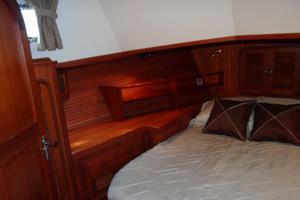 Moving aft down the companionway to port, you enter the guest stateroom with two single berths. 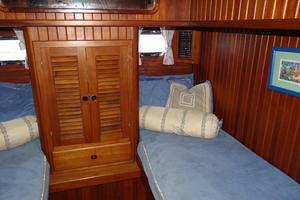 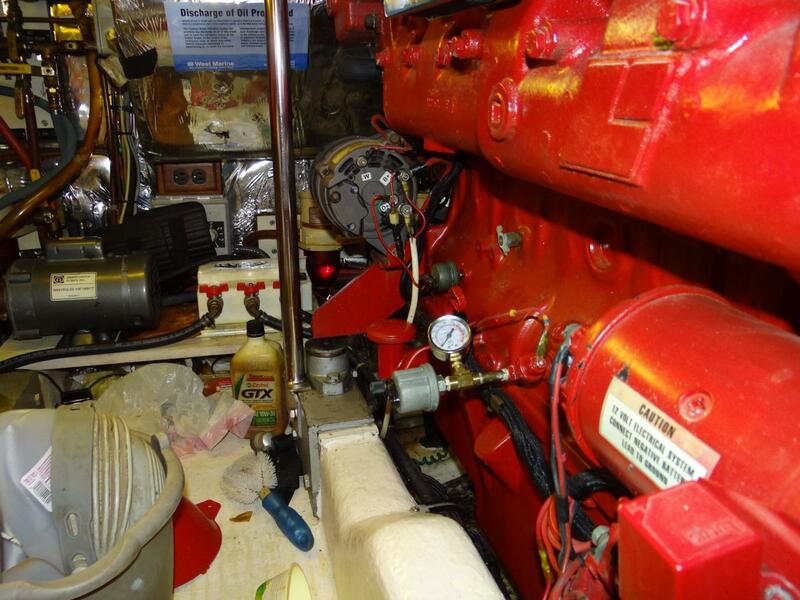 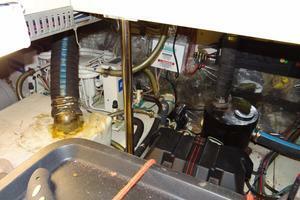 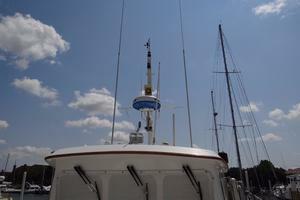 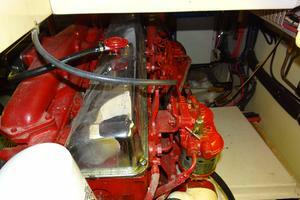 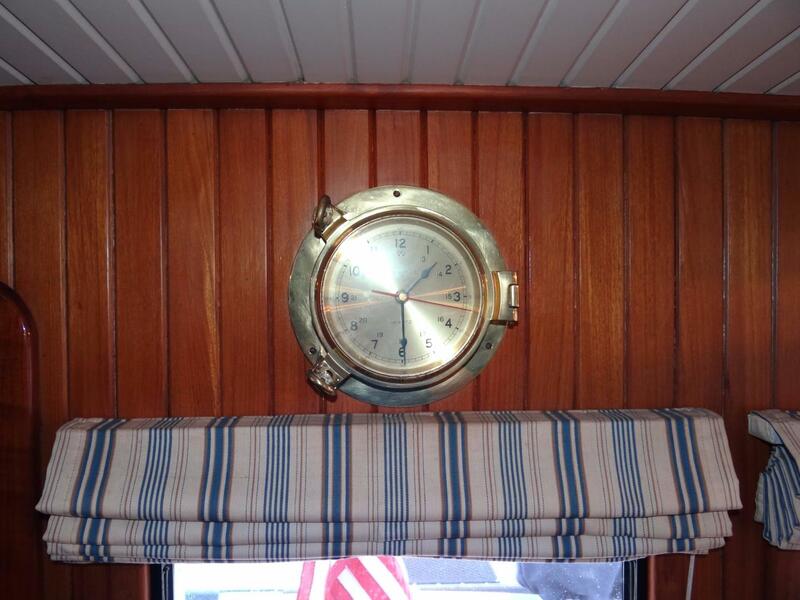 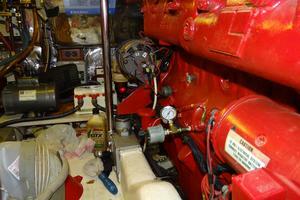 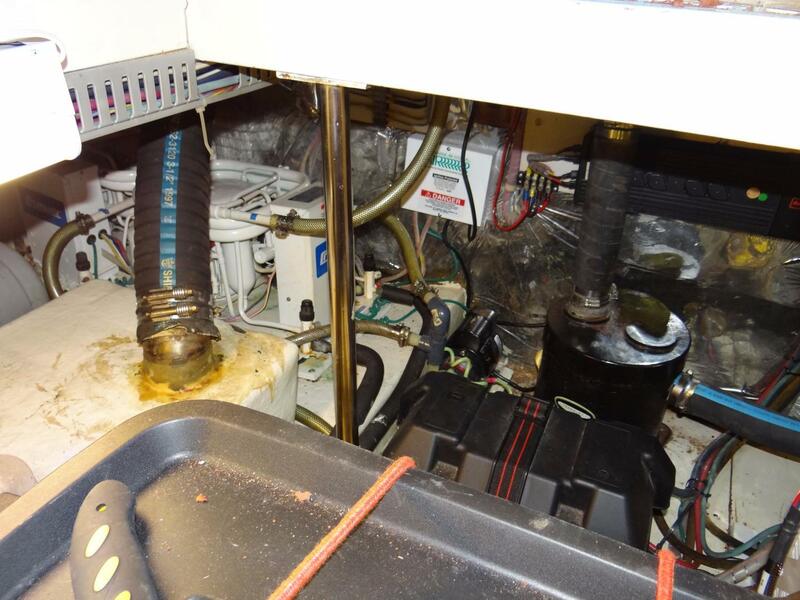 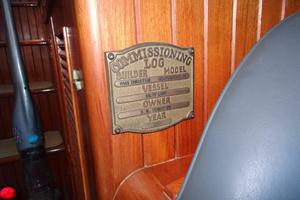 The guest head is conveniently located across the companionway to starboard. 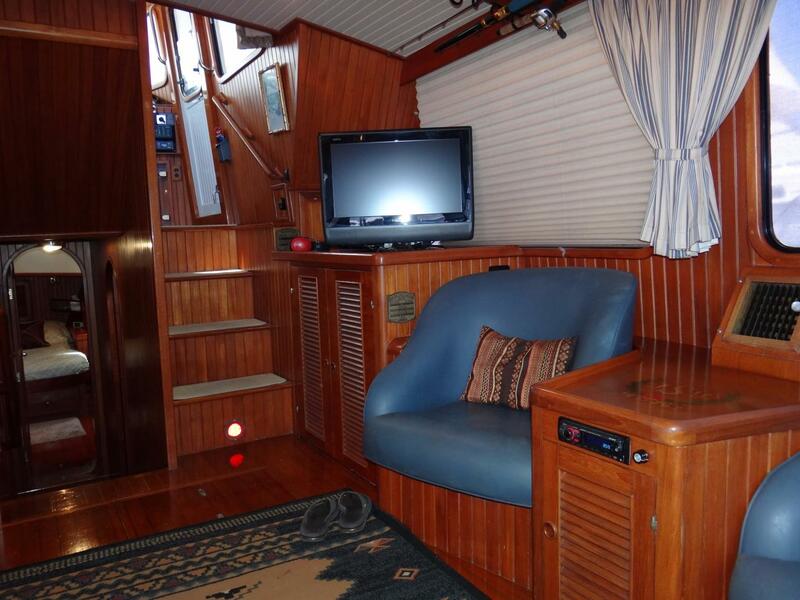 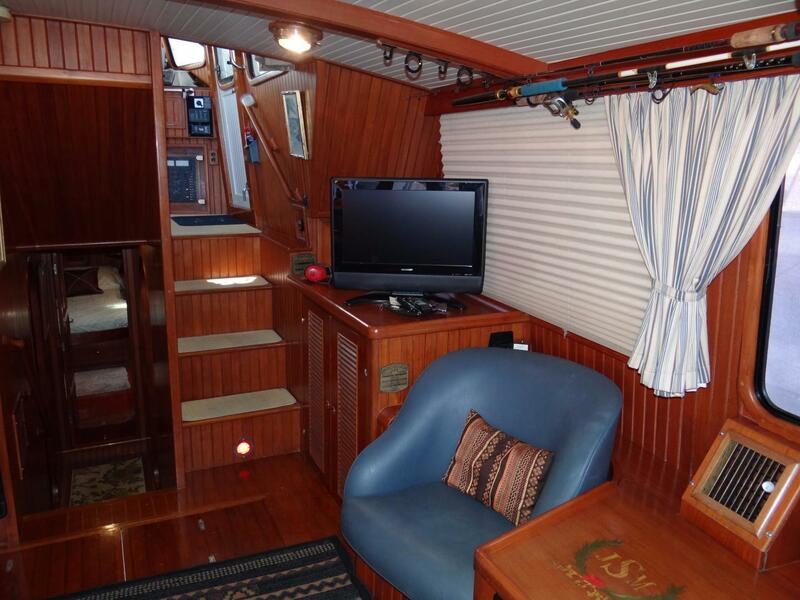 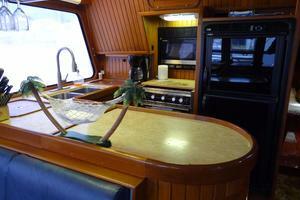 Moving up three steps, you enter the spacious main salon and well-designed galley area. 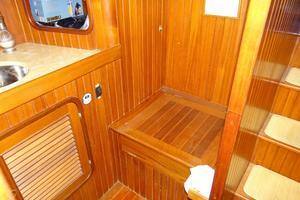 Aft of the salon, the covered teak deck can be accessed through a single door, expanding the entertainment space. 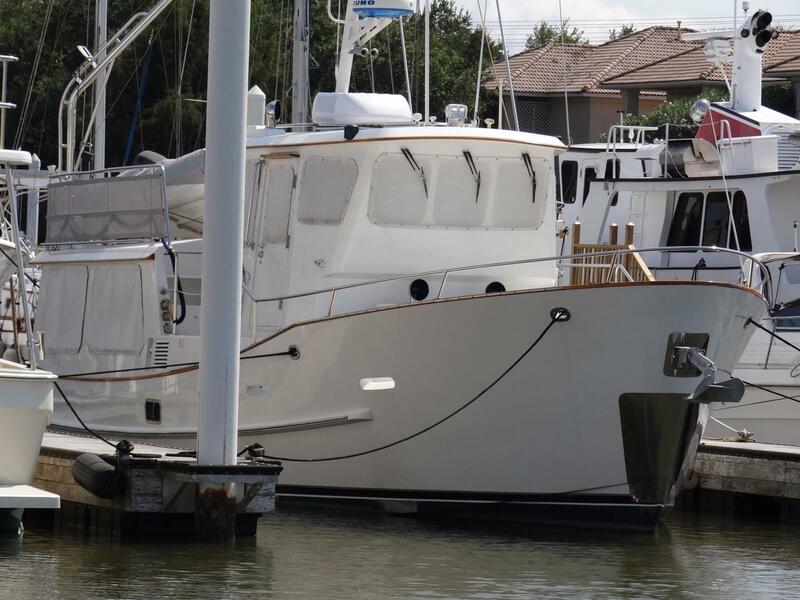 Forward to starboard and up three stairs is the raised pilothouse with a fully equipped helm and comfortable pilot’s chair. 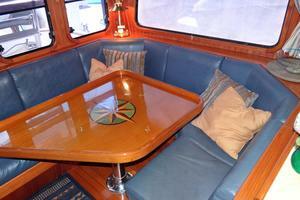 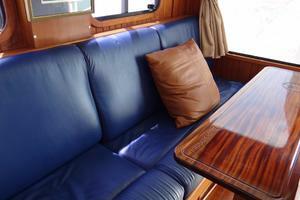 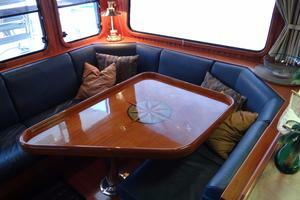 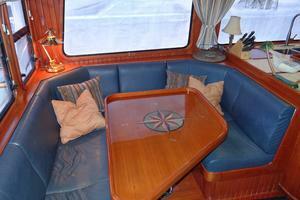 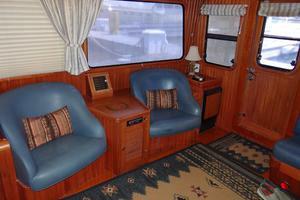 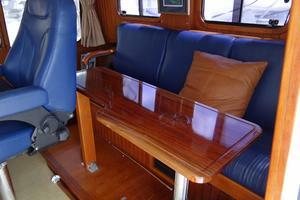 A settee/berth is aft with a custom table. 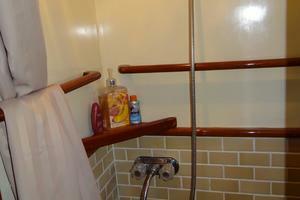 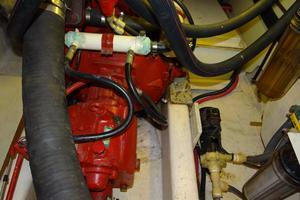 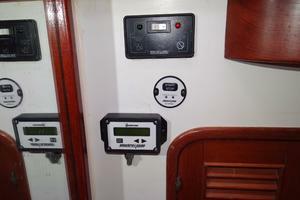 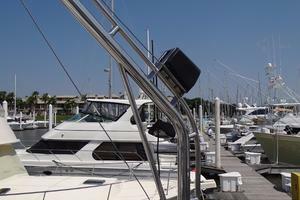 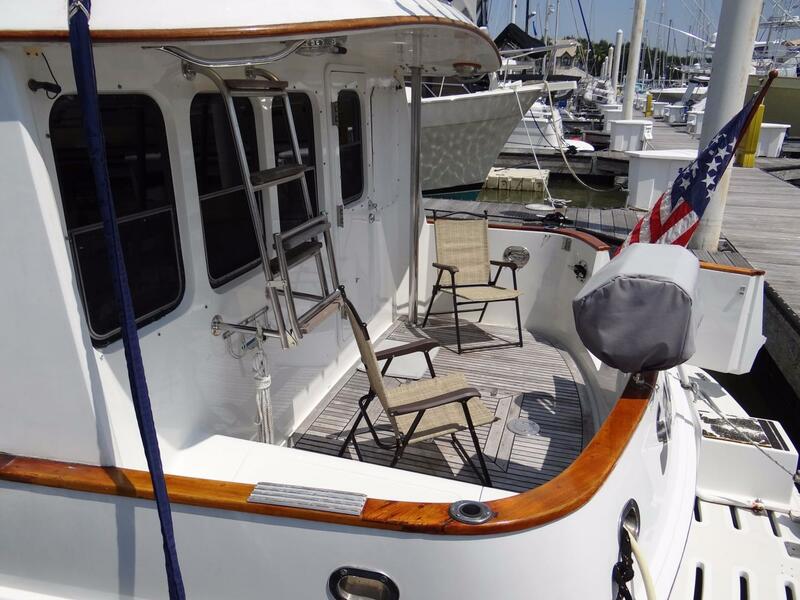 Deck access is provided both port and starboard. 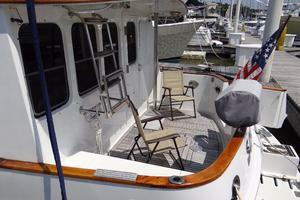 Wide side decks have stairs to access the bridge deck and the bow. 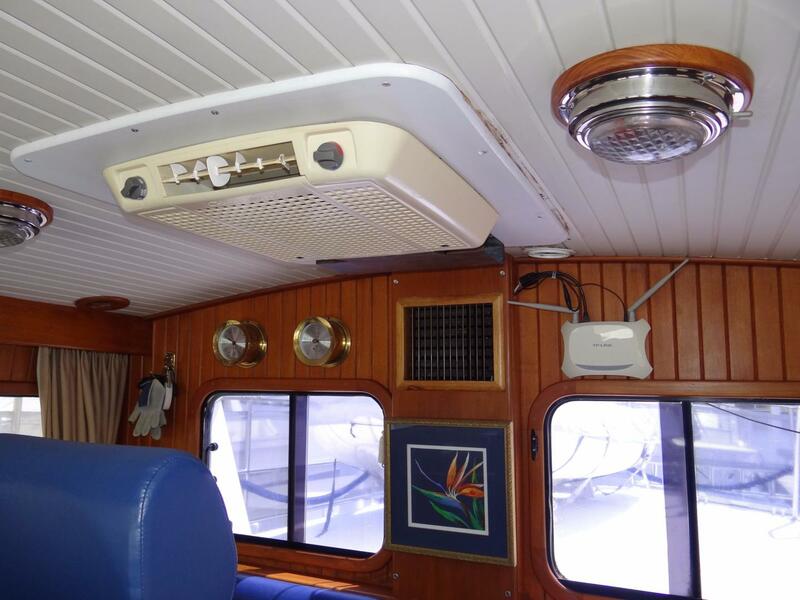 The interior, including the pilothouse, has air conditioning to ensure all passengers are comfortable even in the hottest of climates. 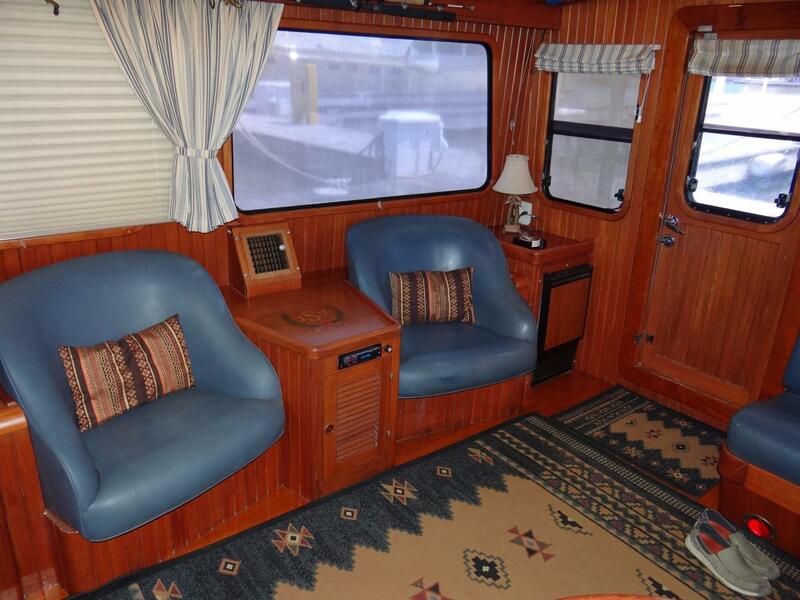 The main salon is very comfortable and has large windows that provide panoramic views and offer a spacious, open and bright feeling while aboard. 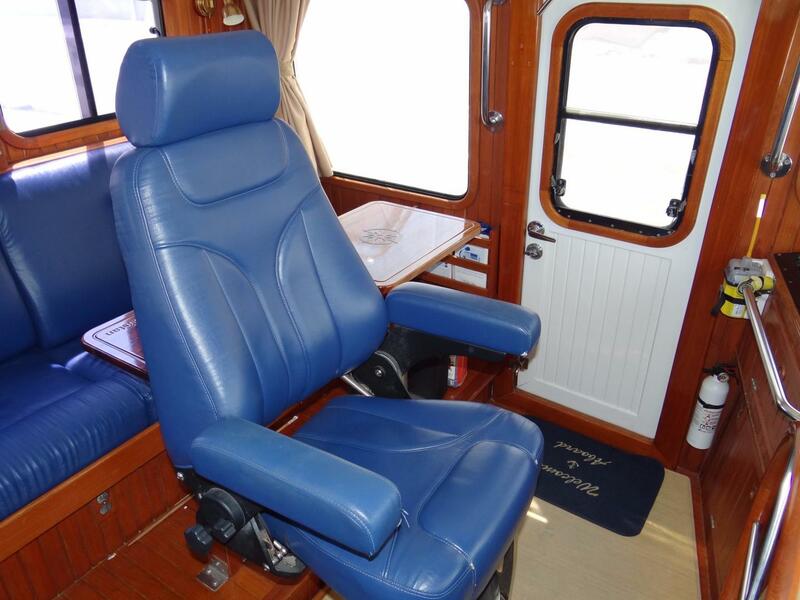 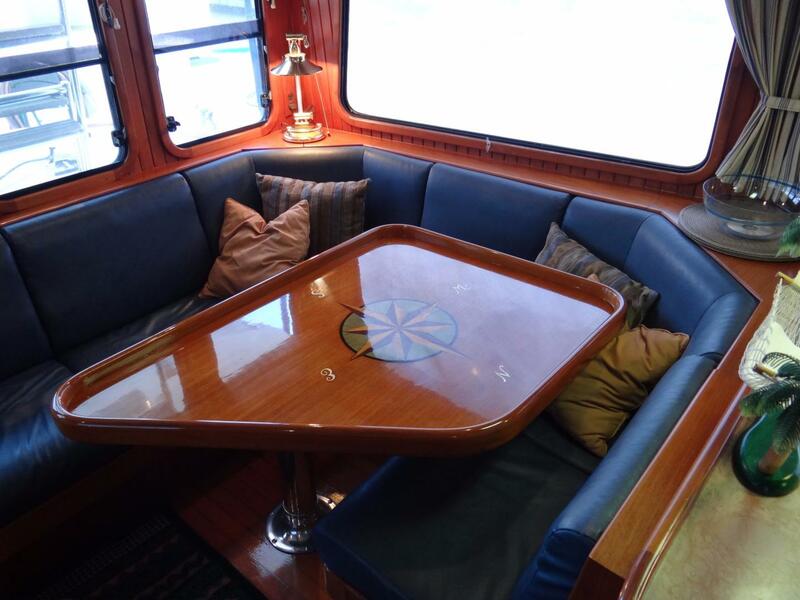 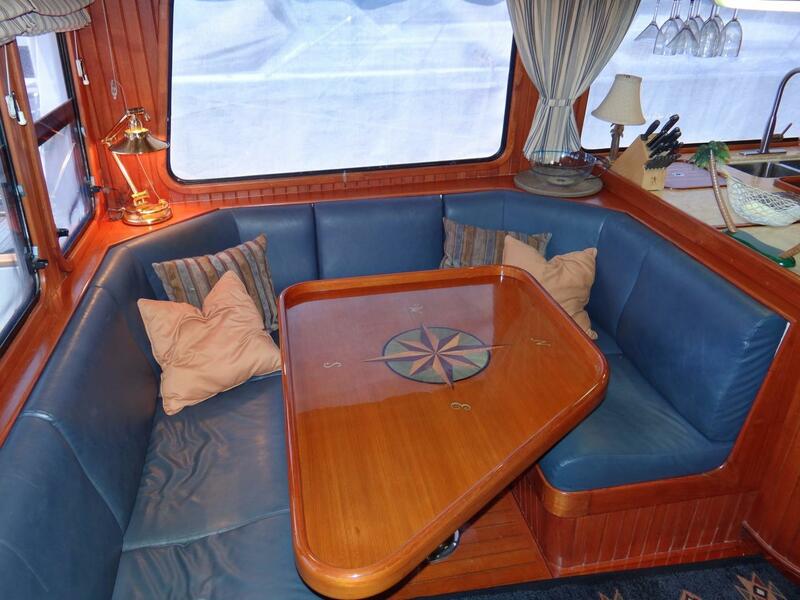 There is a large, U-shaped leather settee around a varnished teak table that seats 6-8 on the port side and two built-in barrel chairs and end tables across to starboard. 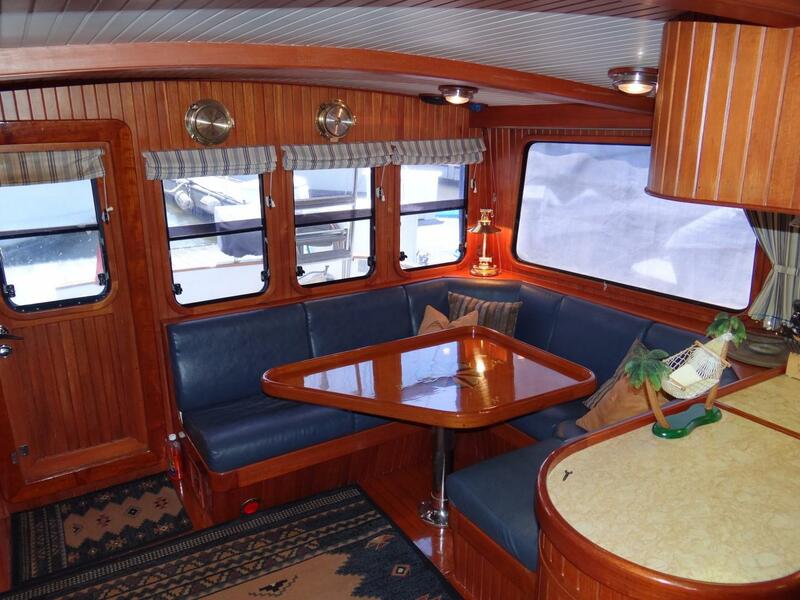 This area has a teak and holly sole and overall, offers an ambiance of elegant simplicity. 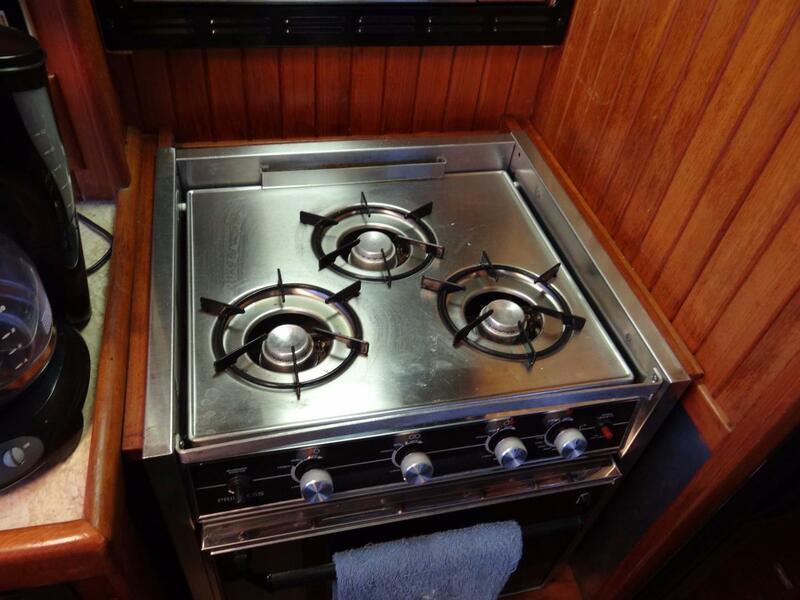 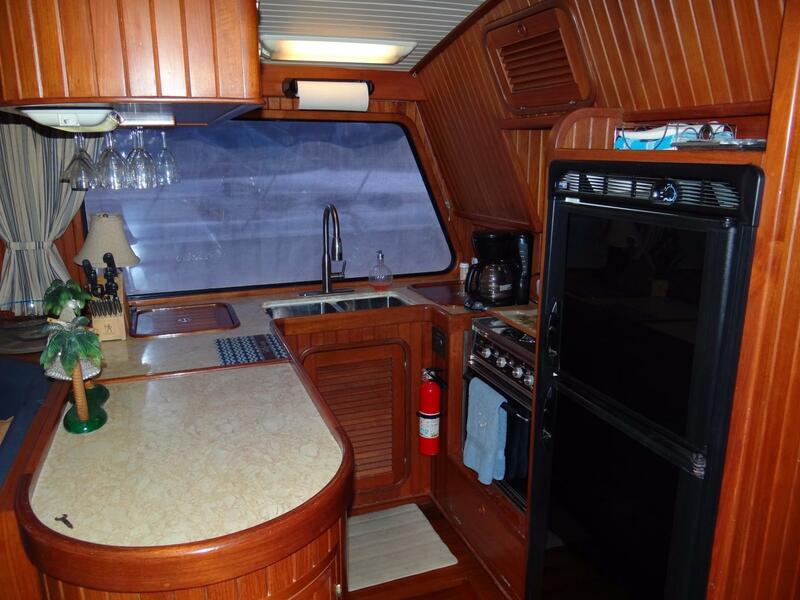 The galley is an open, U-shape in the forward port side of the salon and offers the chef the ability to communicate with guests in the salon while preparing meals. 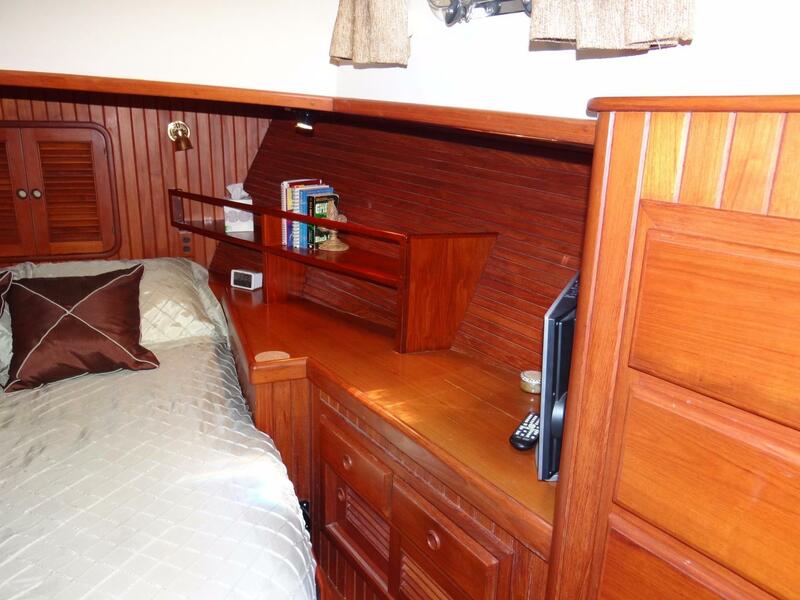 The Master stateroom features a centerline queen berth, hanging locker, drawers and bookshelves that all provide generous storage. 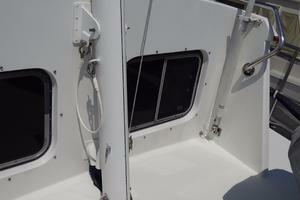 Two opening hatches offer natural light, ventilation and emergency egress. 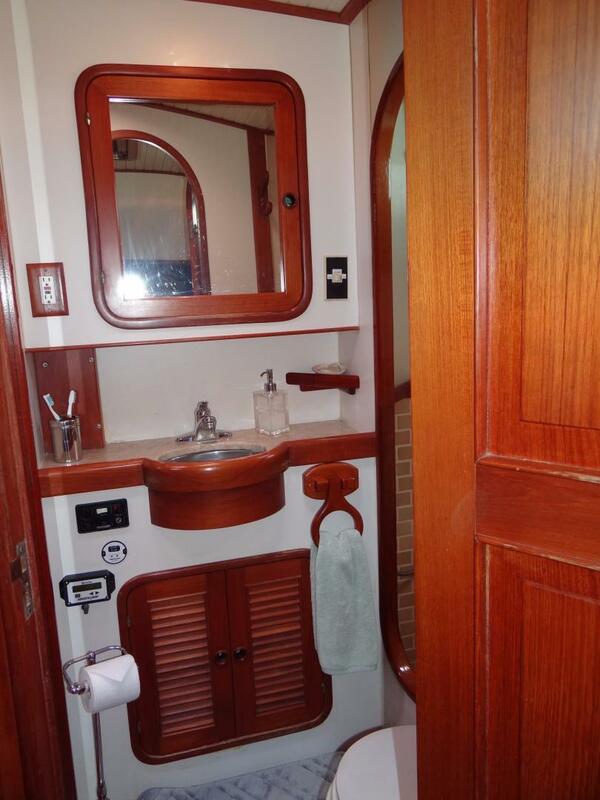 Portside aft is an entry to the ensuite head which has a marble vanity and stainless steel sink with Grohe fixtures, faucet and a Vacuflush toilet. 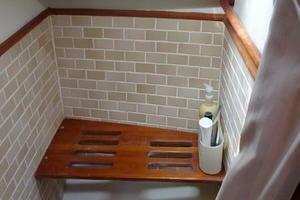 The large tiled stall shower has teak seating, porthole and an opening hatch and deck prism for additional natural light and fresh air. 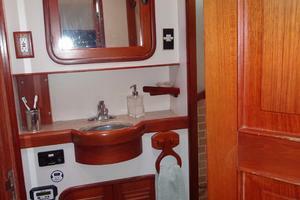 Amidships to port is the comfortable guest stateroom with twin berths and two portals. 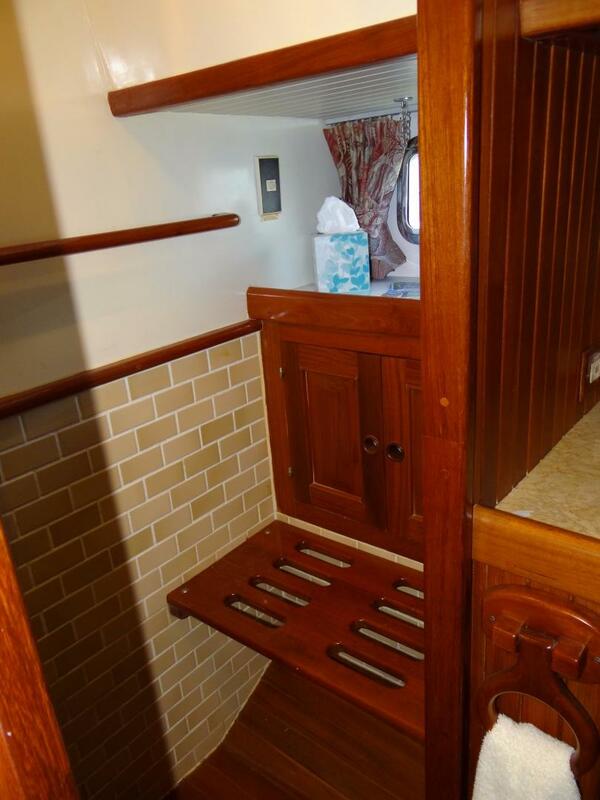 Excellent storage is provided by a large hanging locker between berths, lockers overhead and drawers and cabinets under the berths. 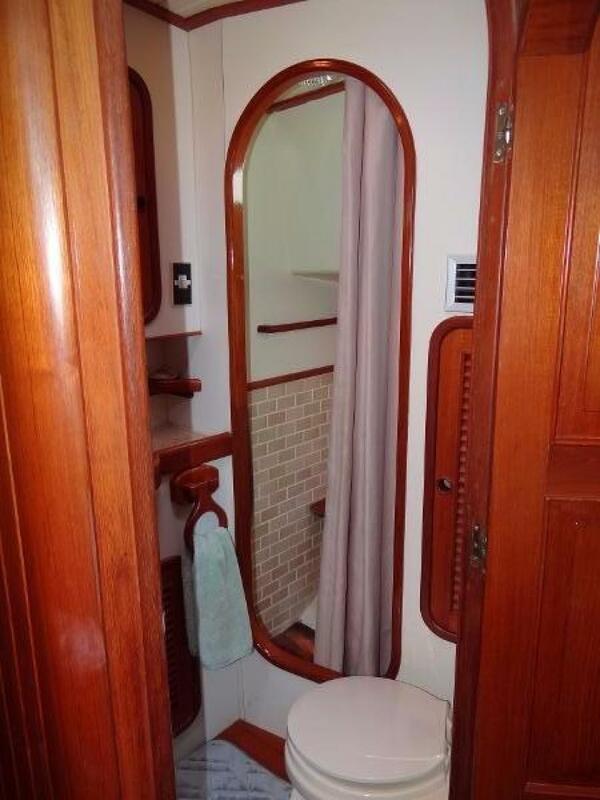 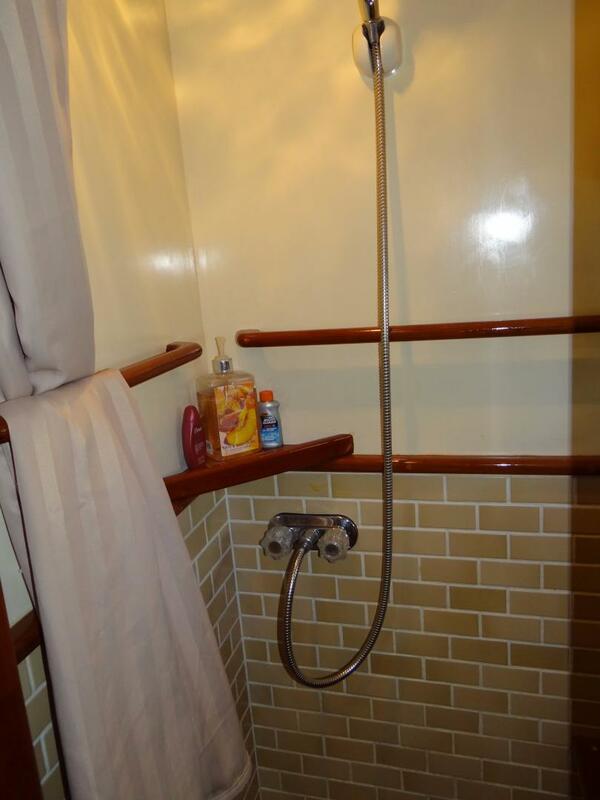 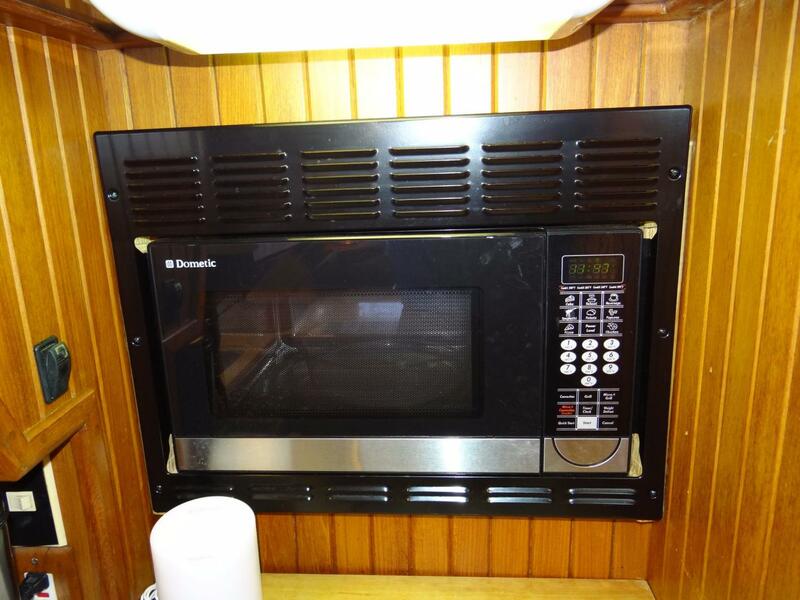 The guest head is across the hall to starboard and has a marble vanity and stainless steel sink with Grohe fixtures, faucet and a Vacuflush toilet. 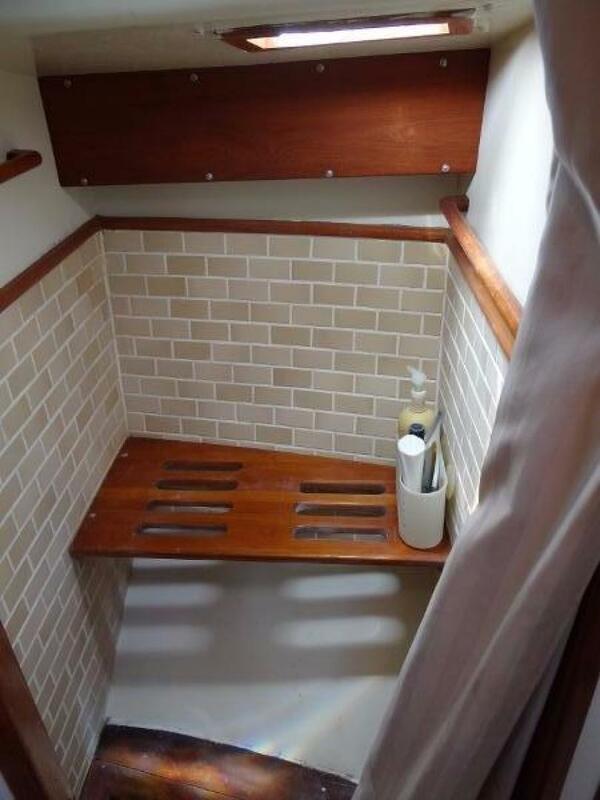 The large, tiled stall shower has teak seating, porthole and an opening hatch and deck prism for additional light and fresh air. 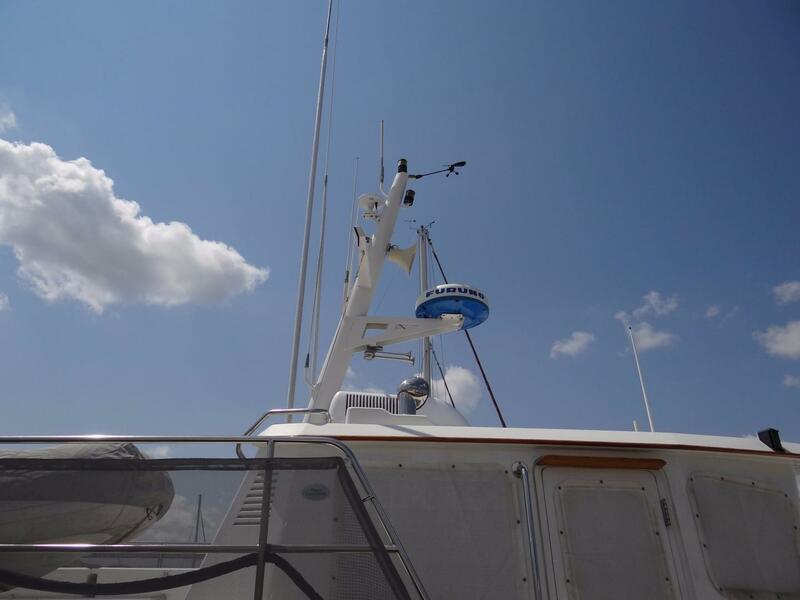 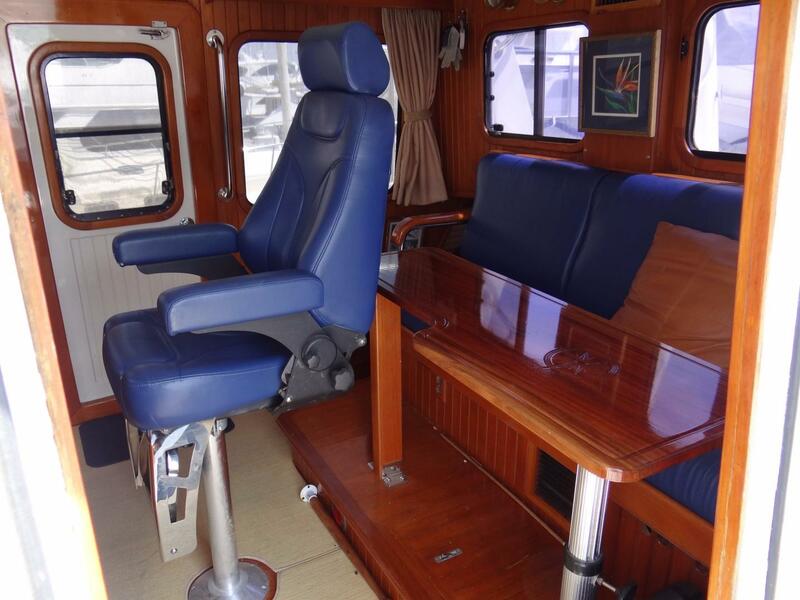 The pilothouse is the center of command and can be easily accessed from the interior via three steps on the forward, starboard side of the salon. 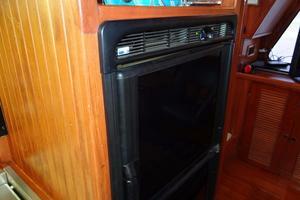 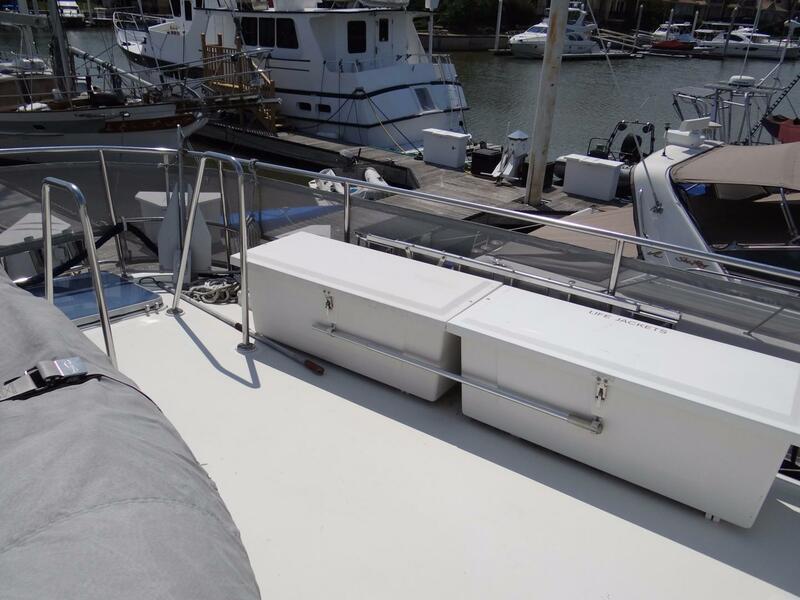 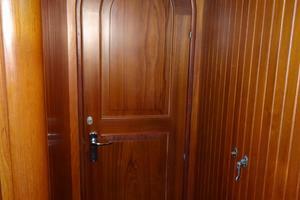 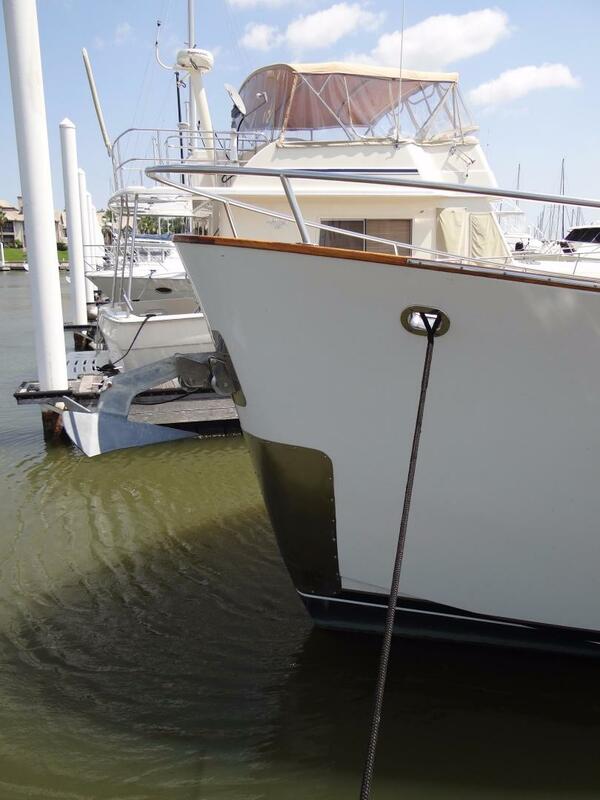 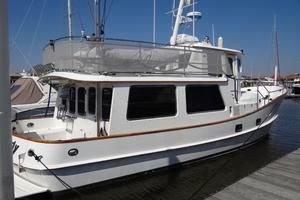 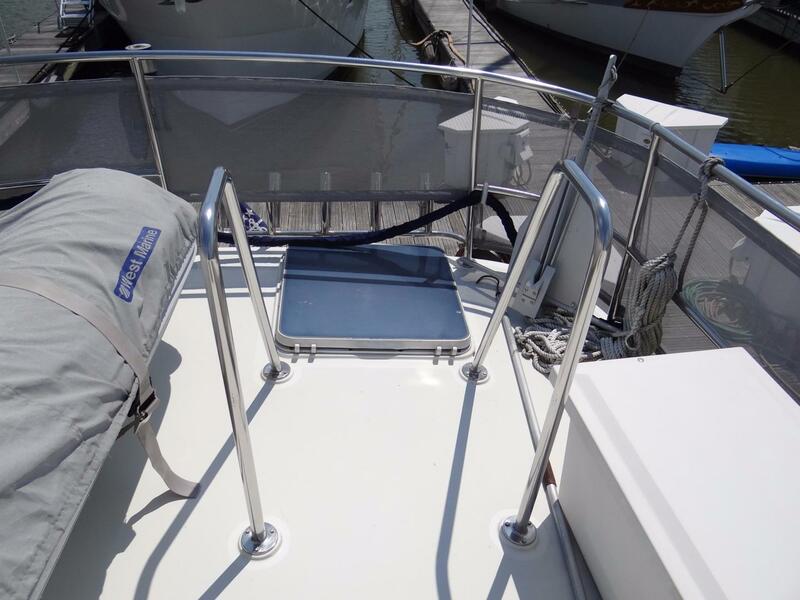 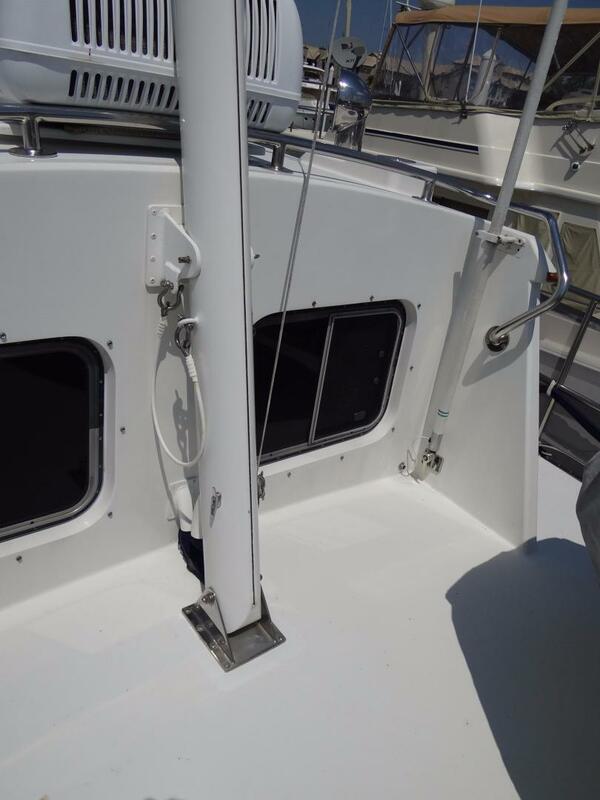 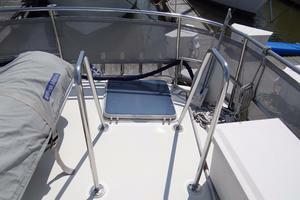 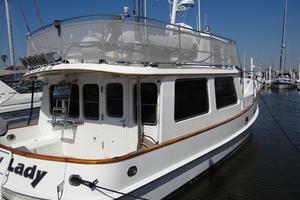 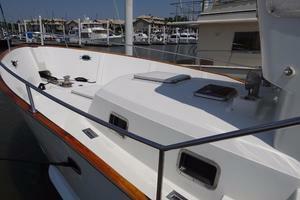 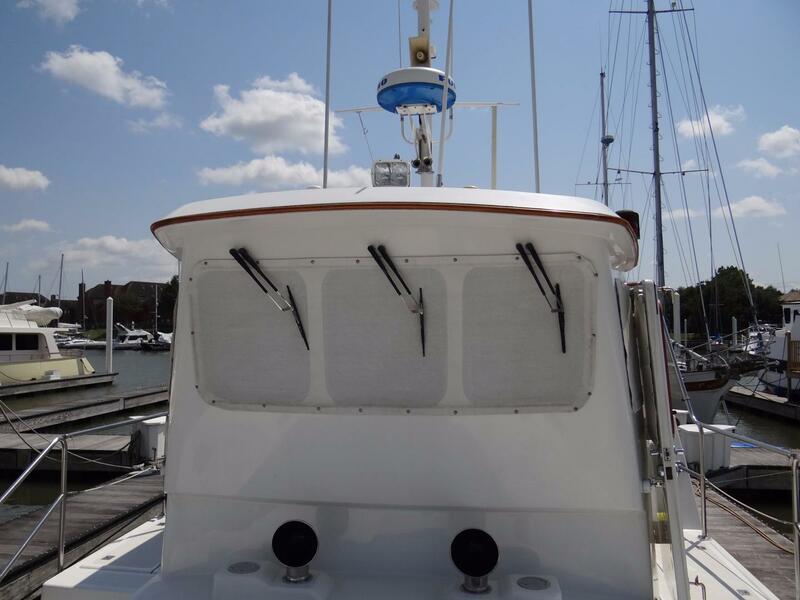 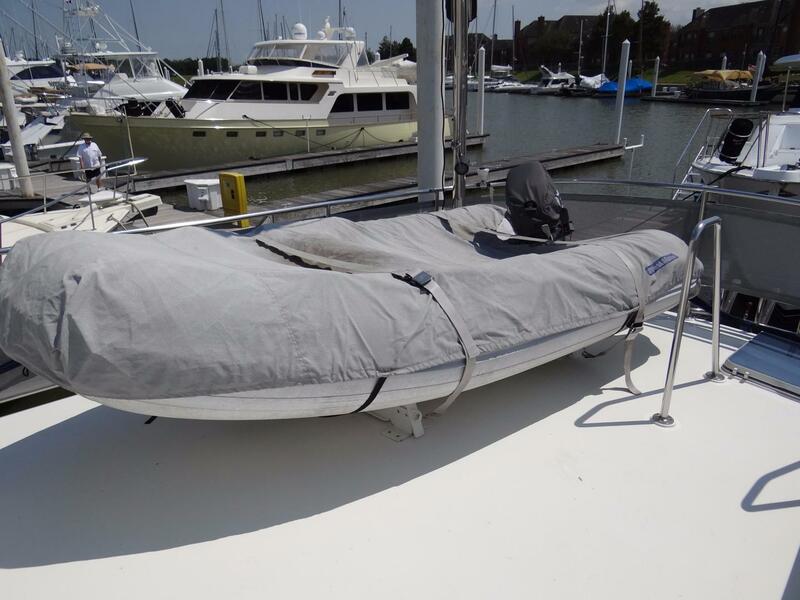 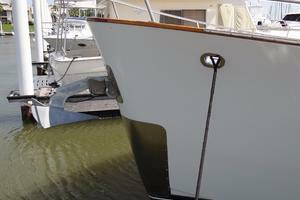 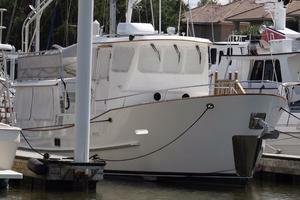 Side doors, both port and starboard, offer easy deck access. There is a blue leather settee/berth with a custom table just aft of a matching blue leather, Stidd pedestal mounted helm seat. 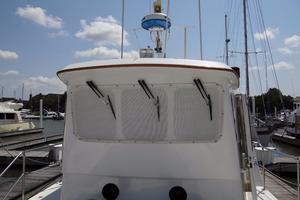 There are 4 opening windows and 2 opening hatches. 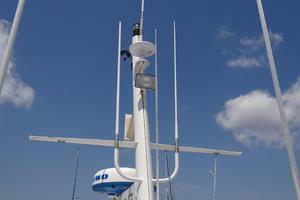 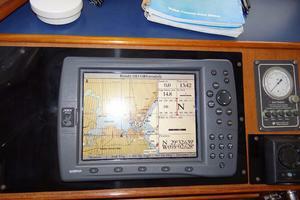 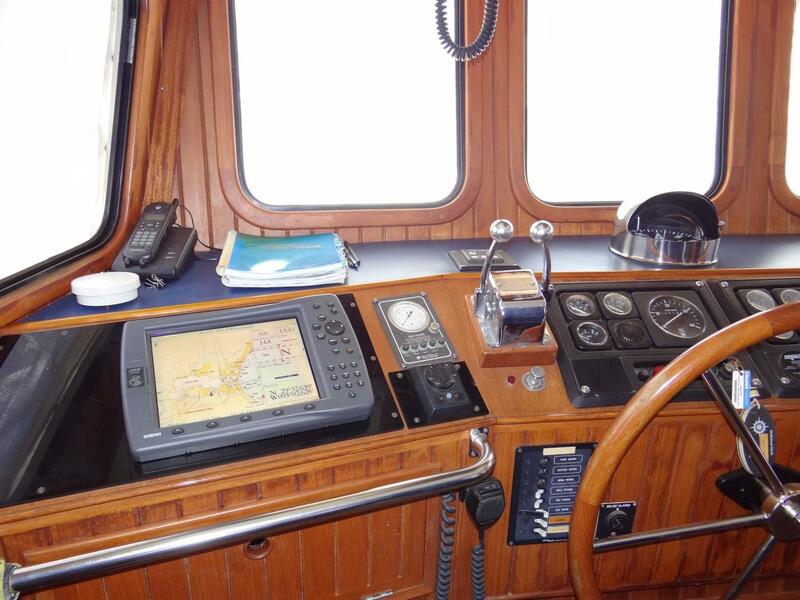 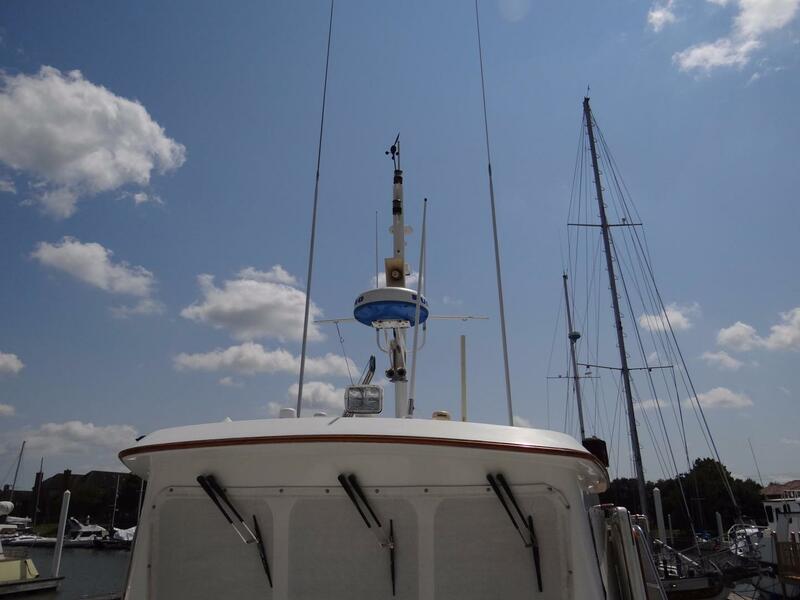 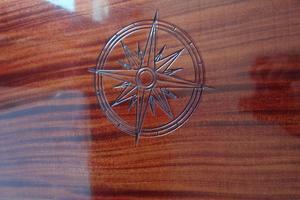 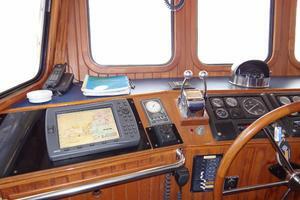 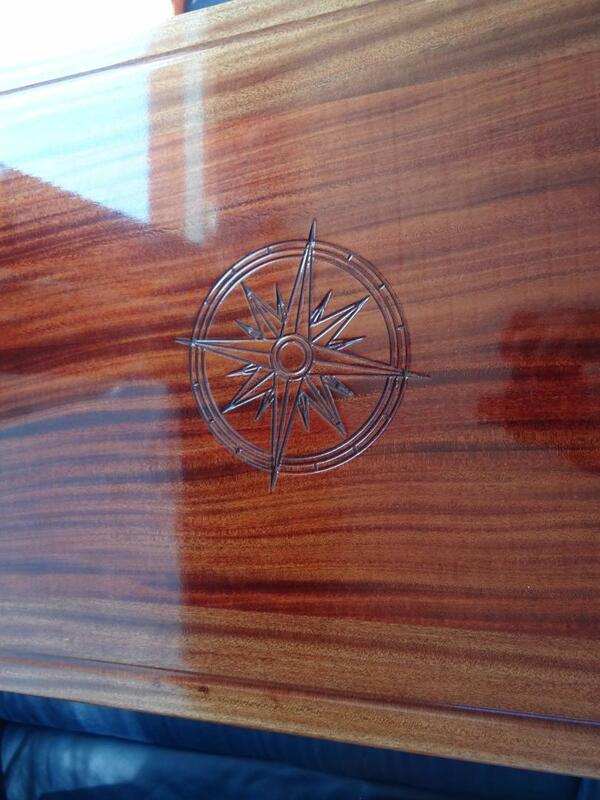 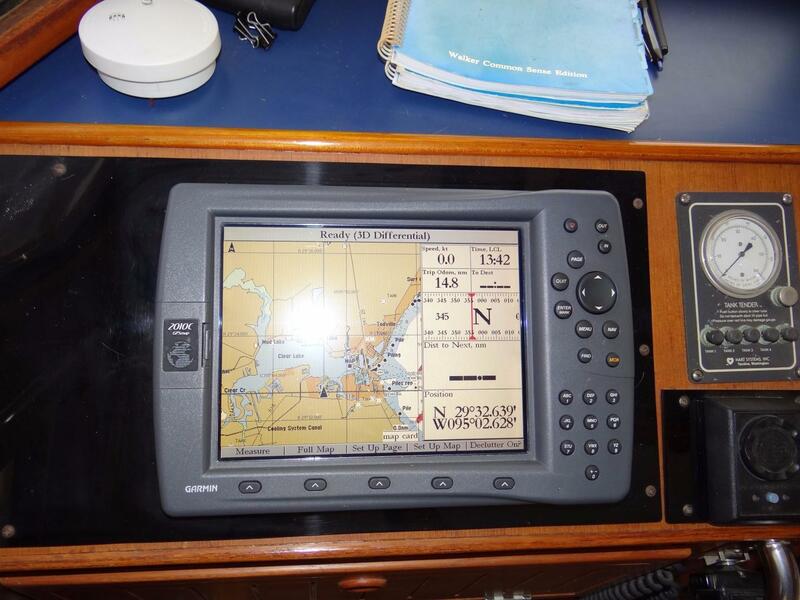 The helm has a vast array of navigational aids providing the captain and crew with the ability to cruise worldwide. 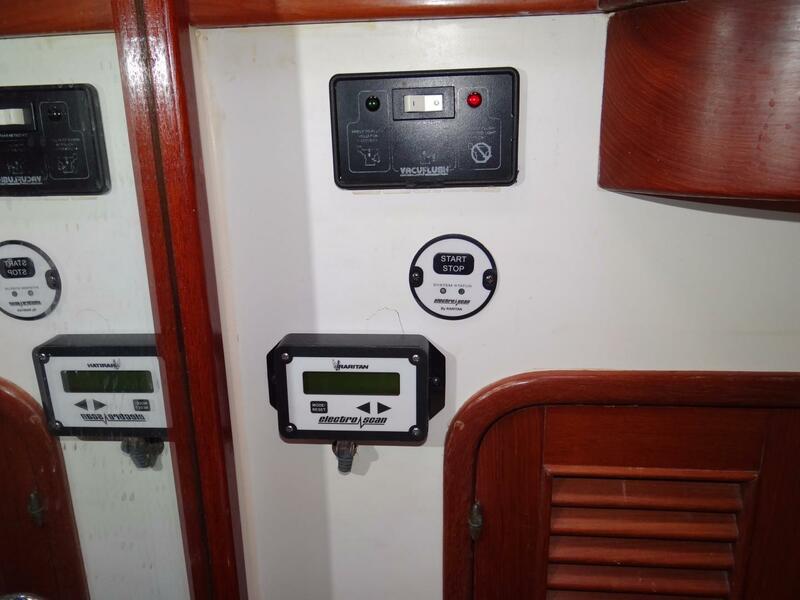 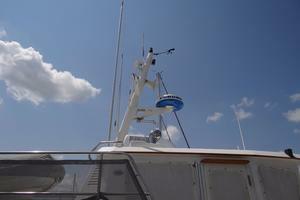 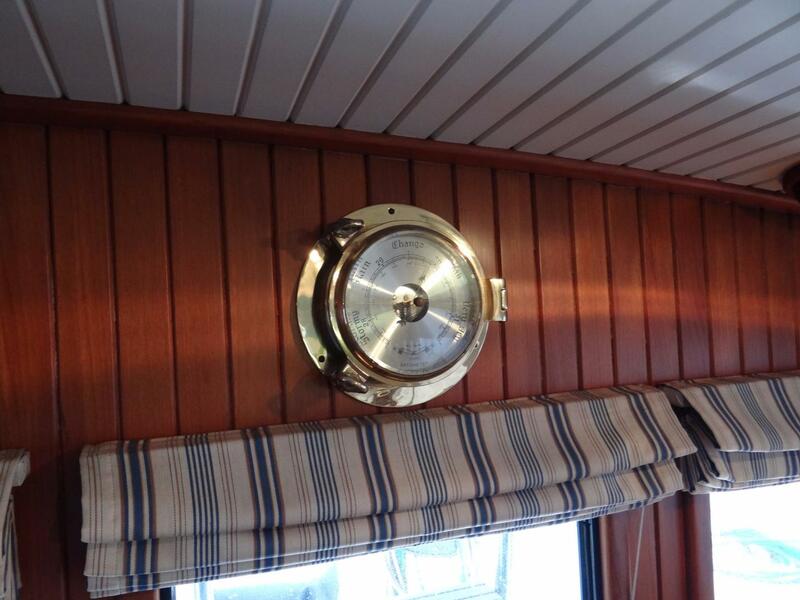 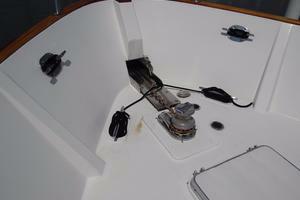 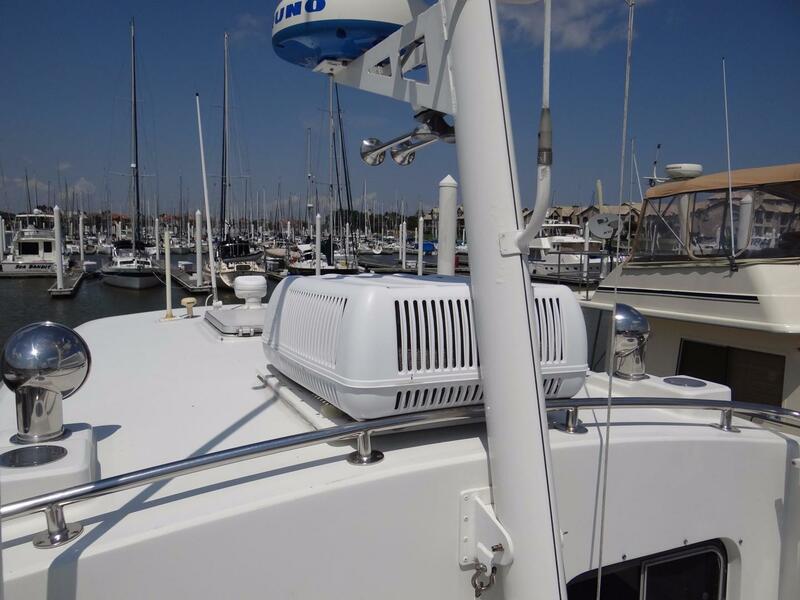 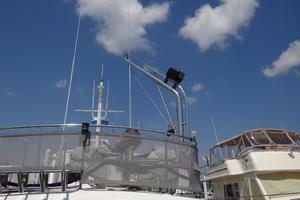 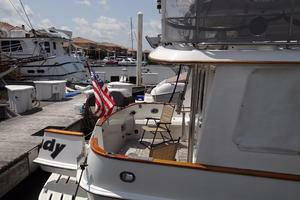 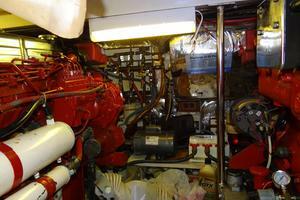 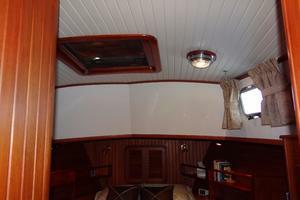 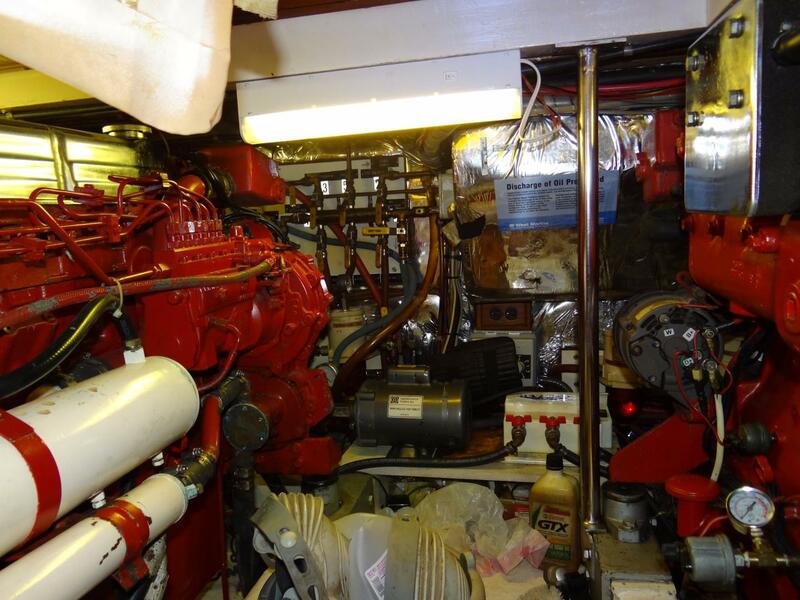 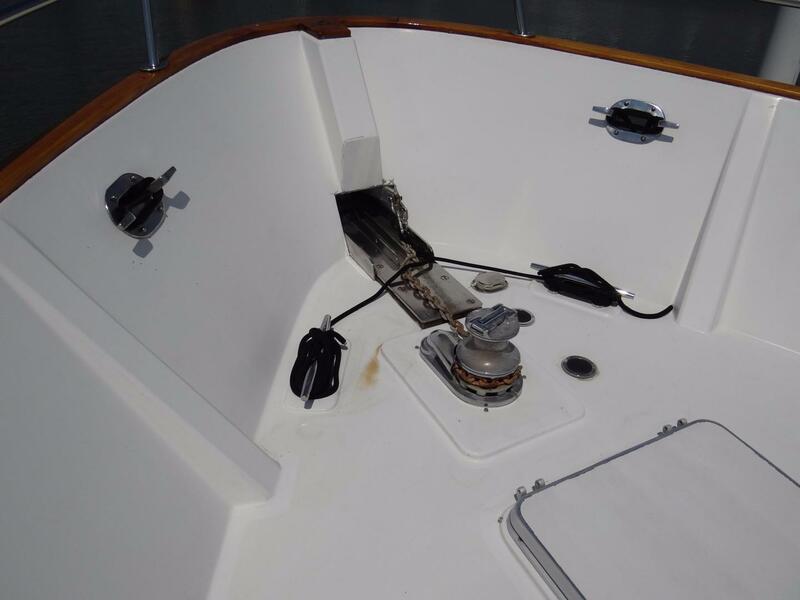 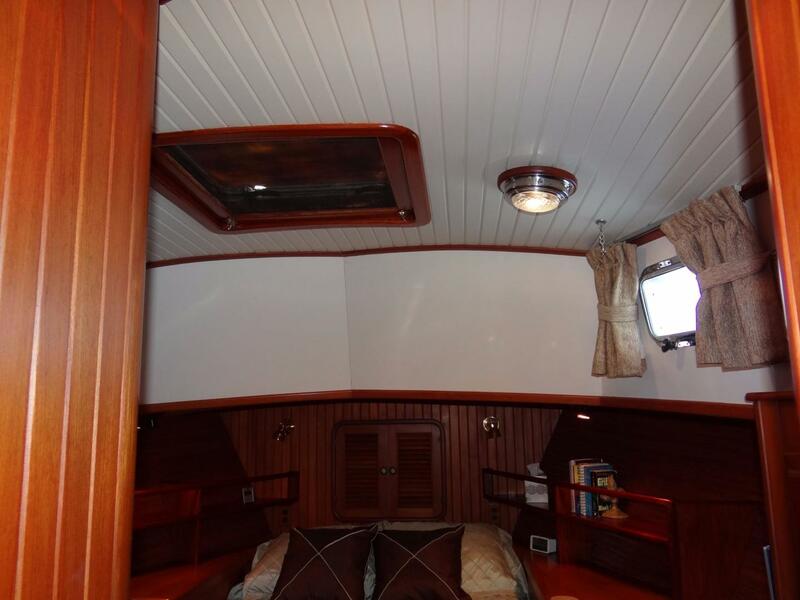 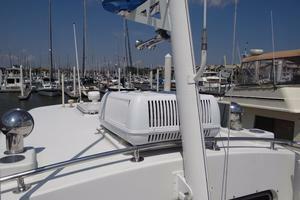 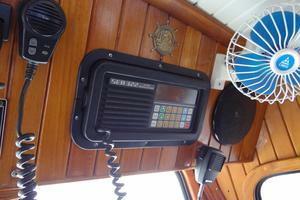 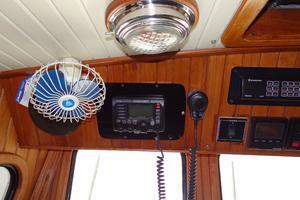 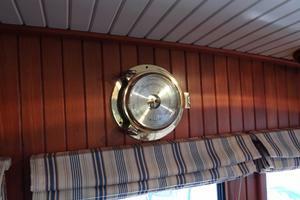 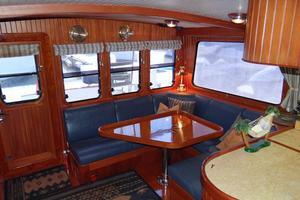 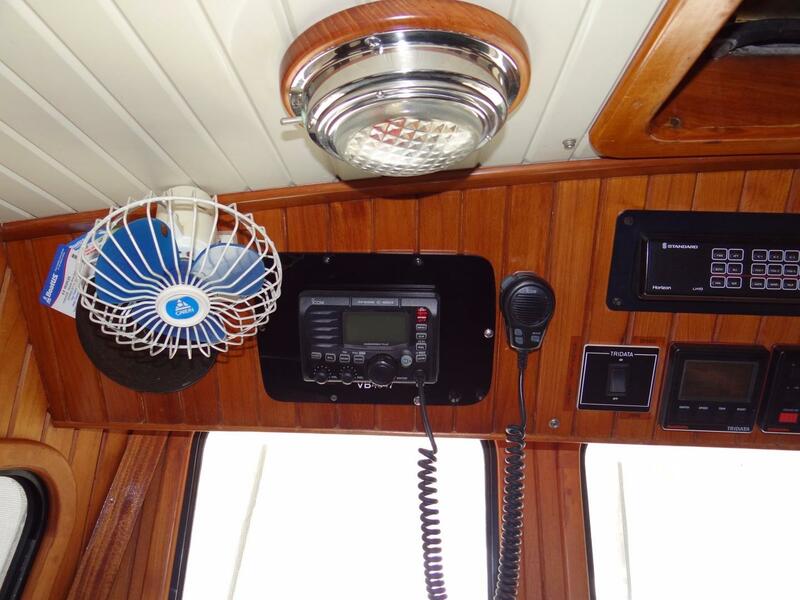 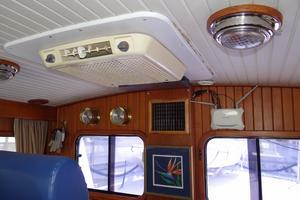 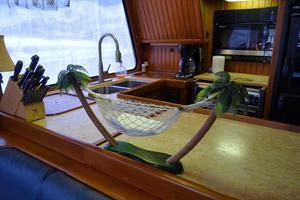 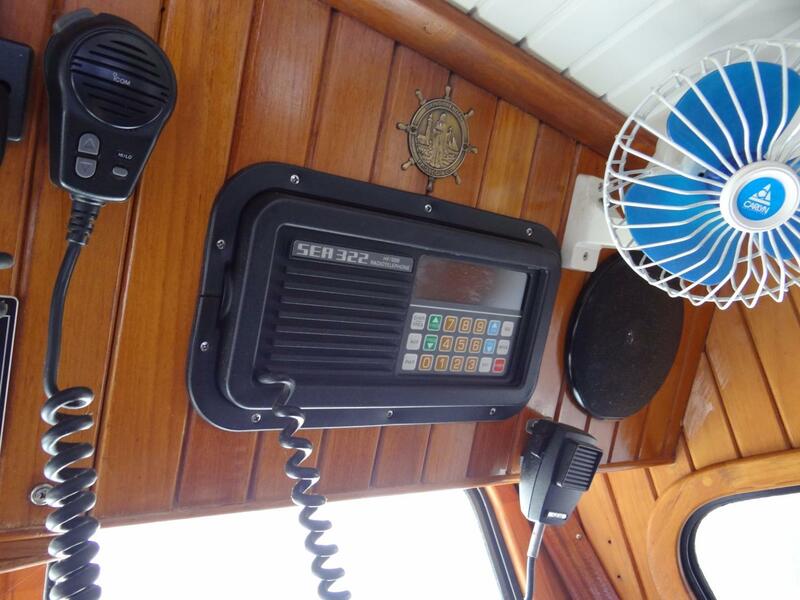 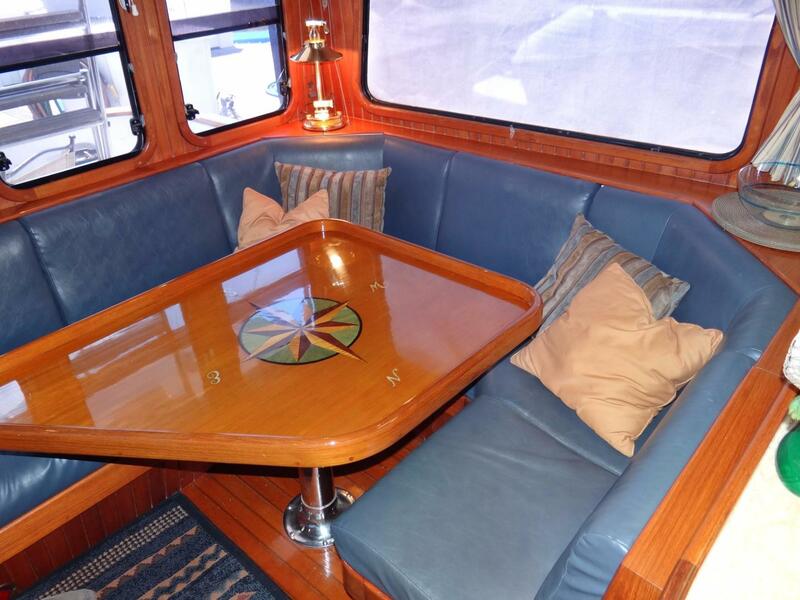 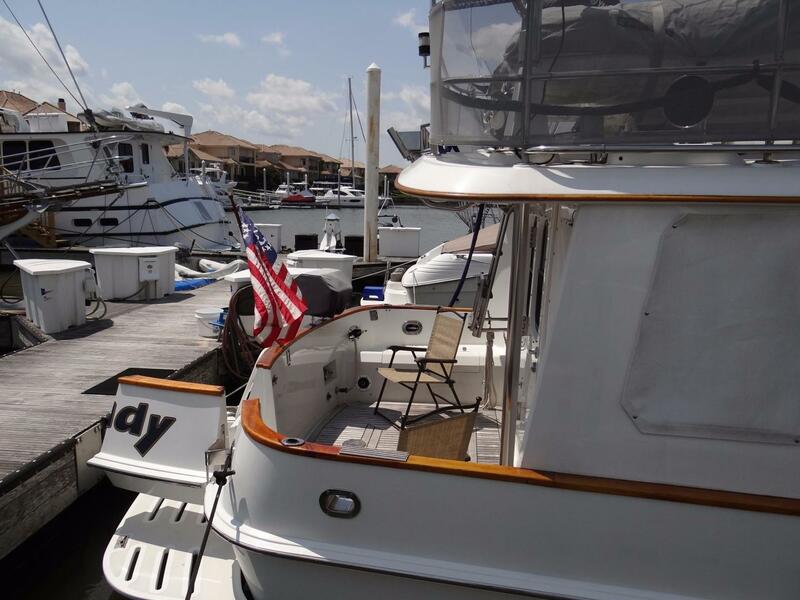 The deck area of Salty Lady is equipped with Atkins Hoyle port lights and hatches. 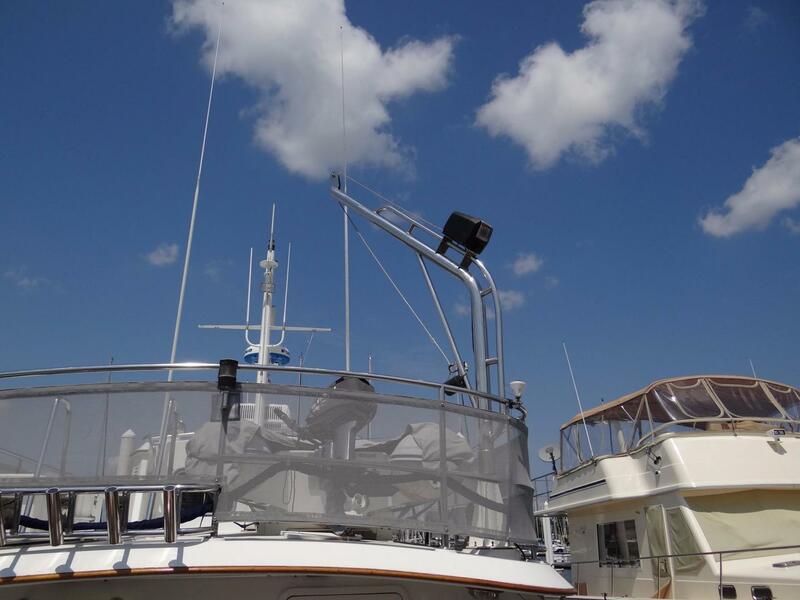 A large, unobstructed top deck has a folding mast (designed to be easily lowered) with radar, navigation lights and wind instruments. 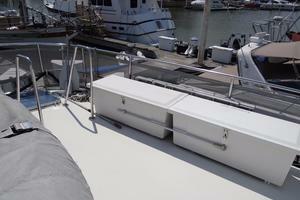 This area also includes deck boxes and a 3000 lb. 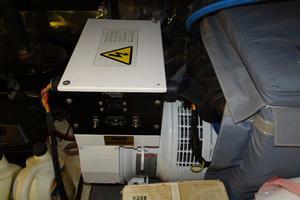 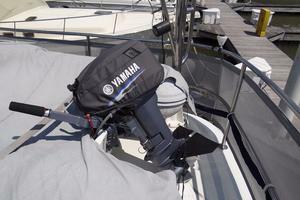 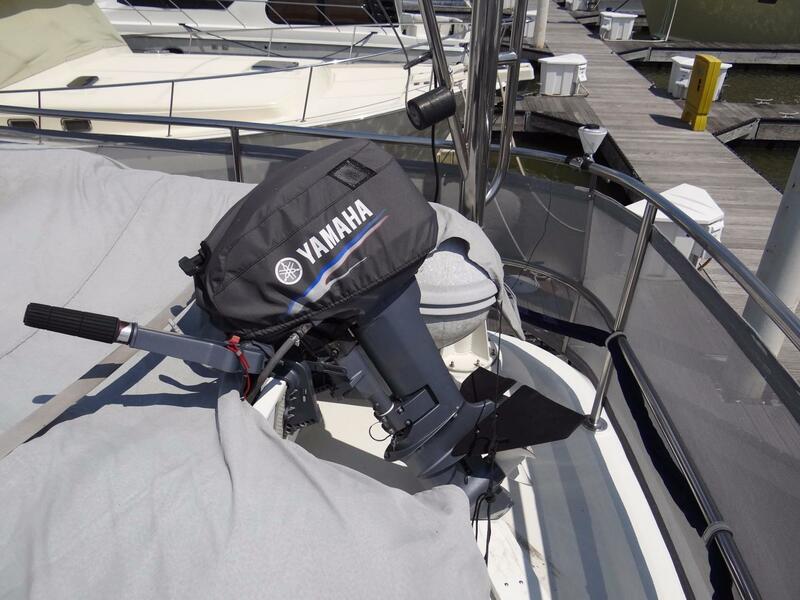 power winch for the stainless steel dinghy davit and a cradle for the inflatable dinghy and outboard Yamaha motor. 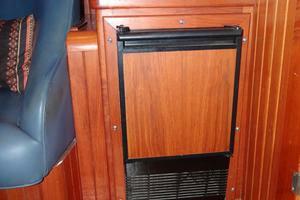 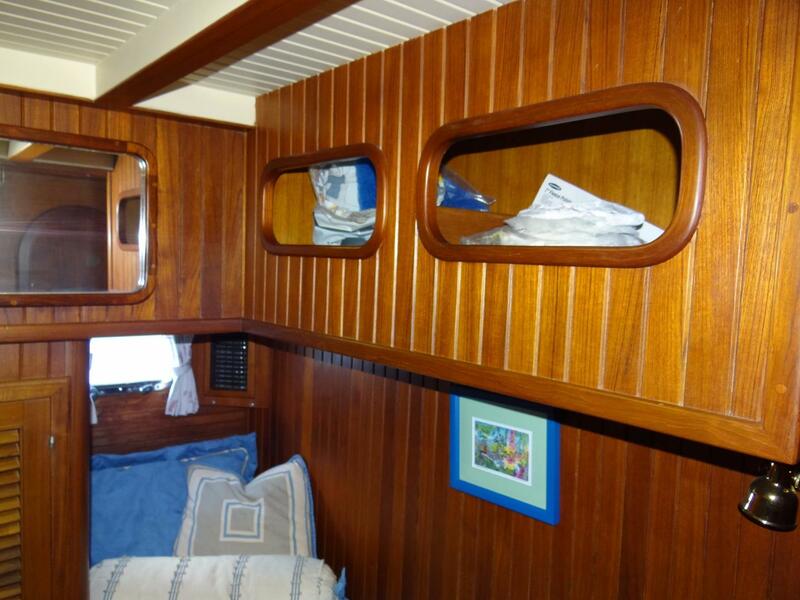 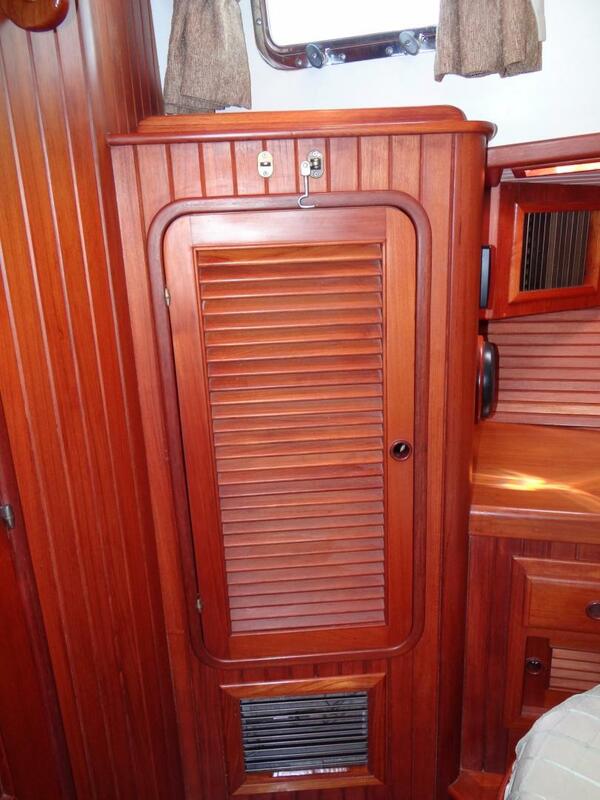 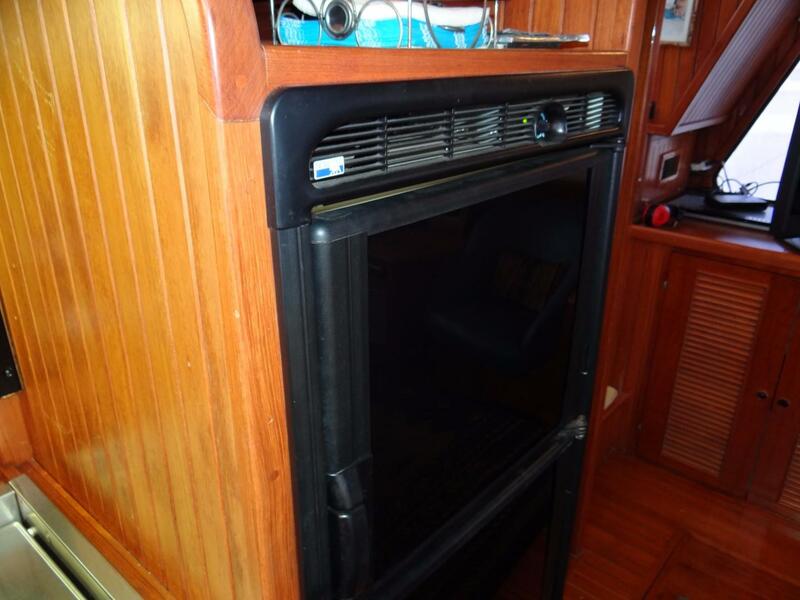 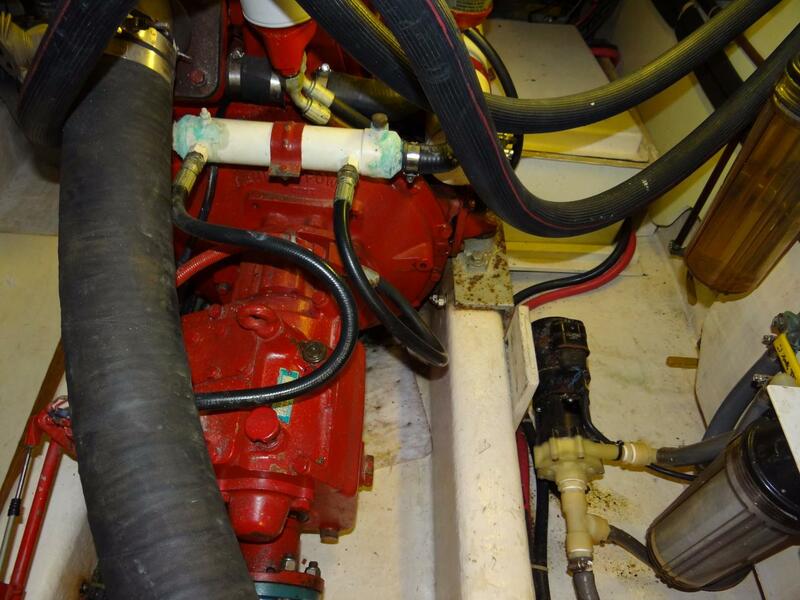 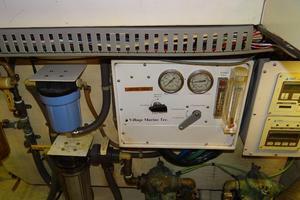 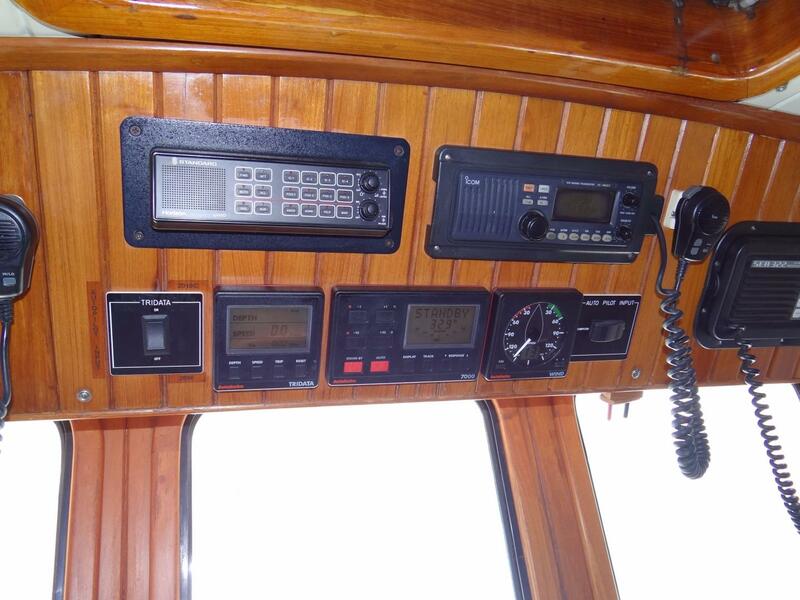 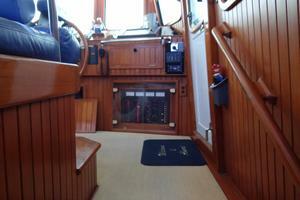 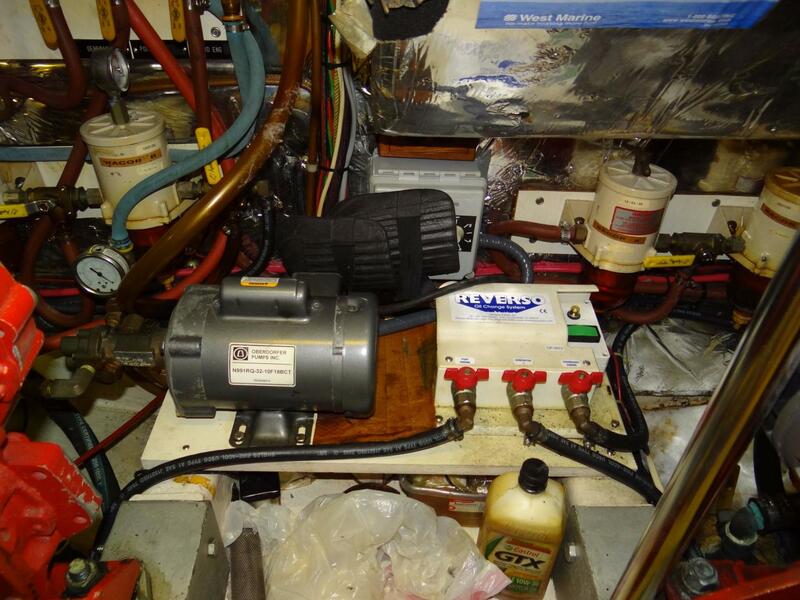 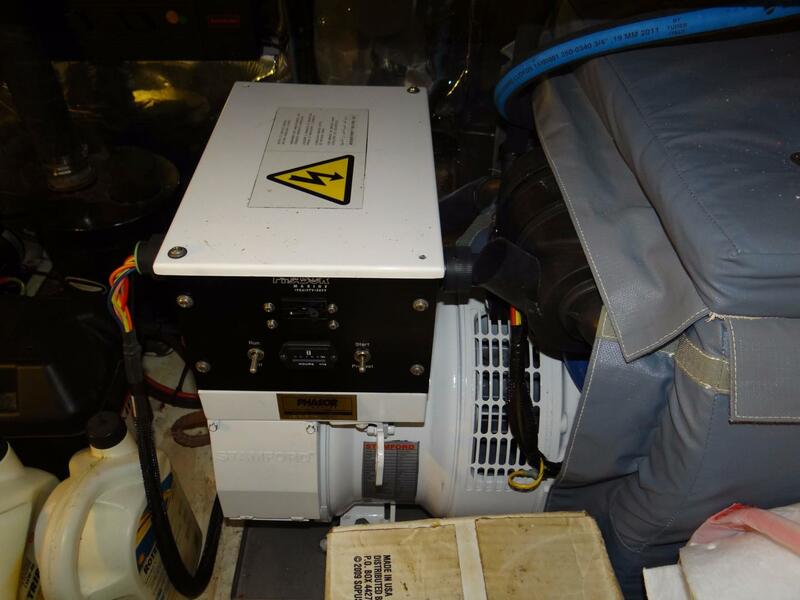 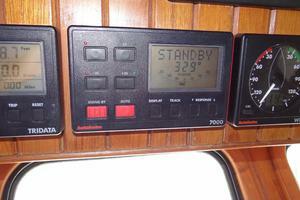 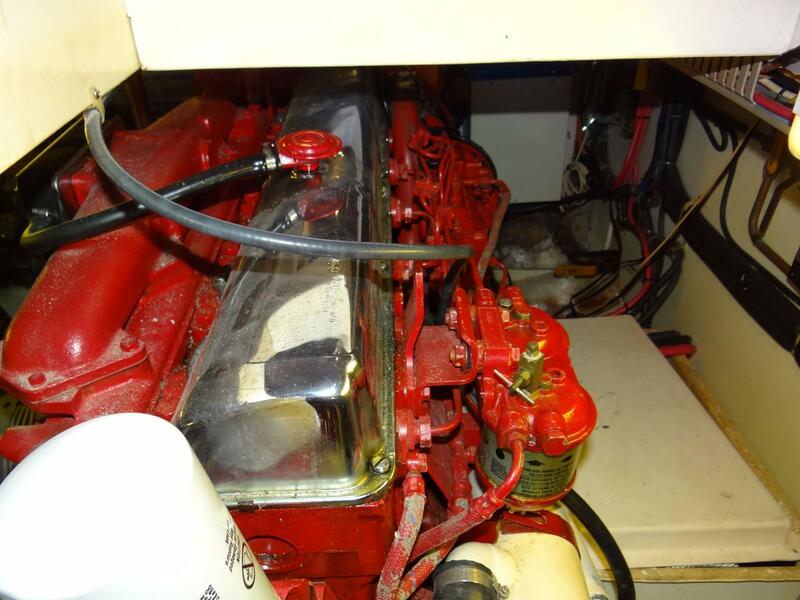 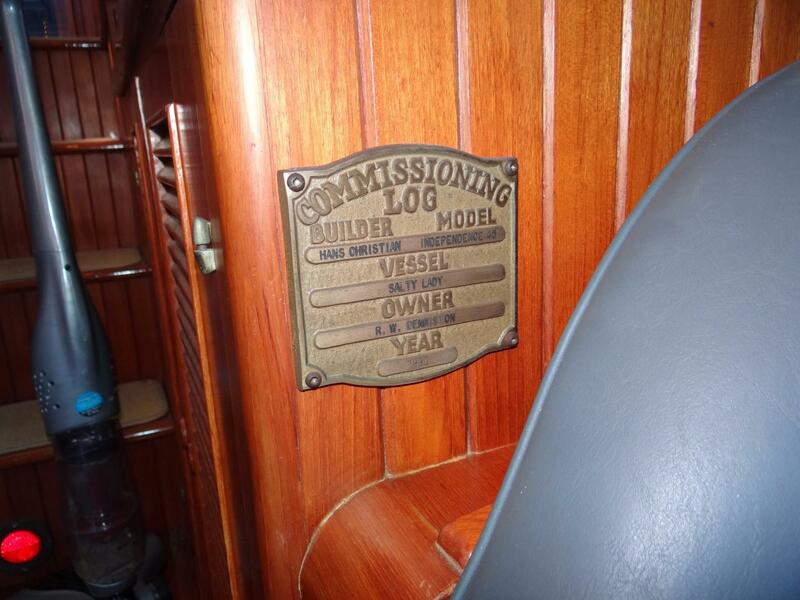 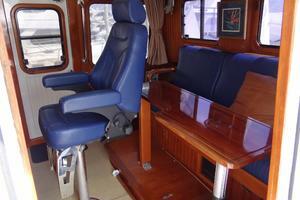 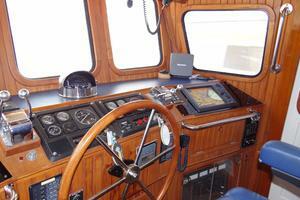 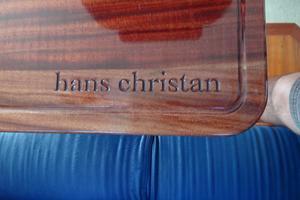 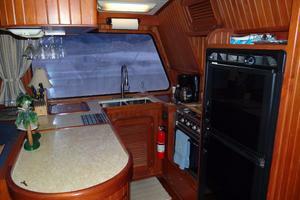 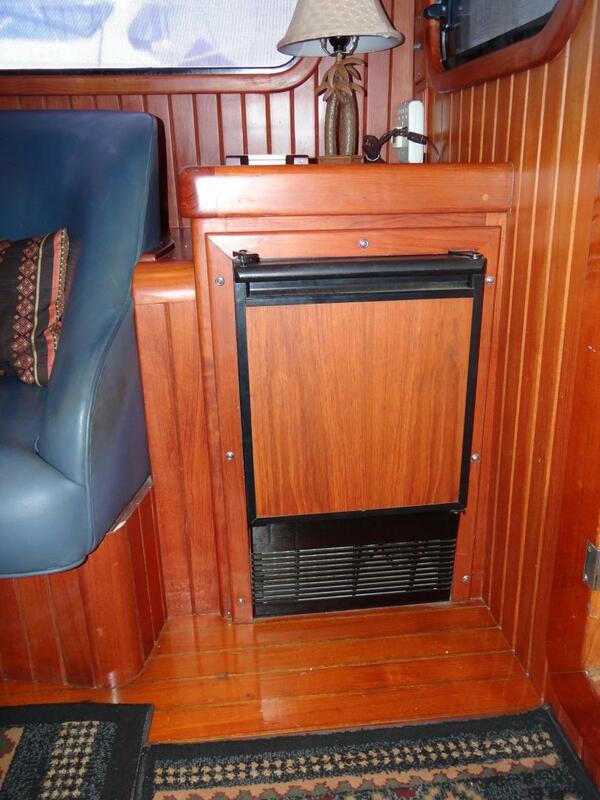 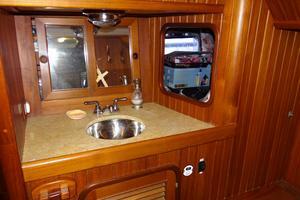 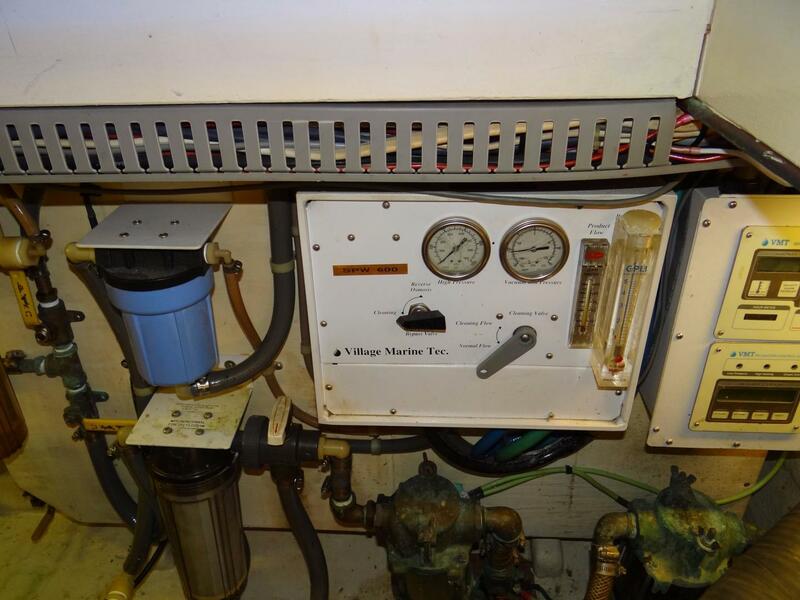 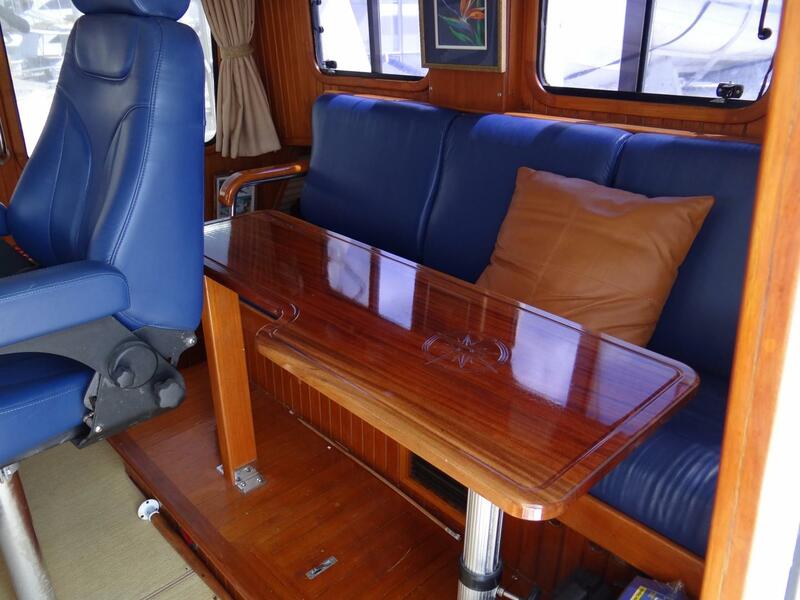 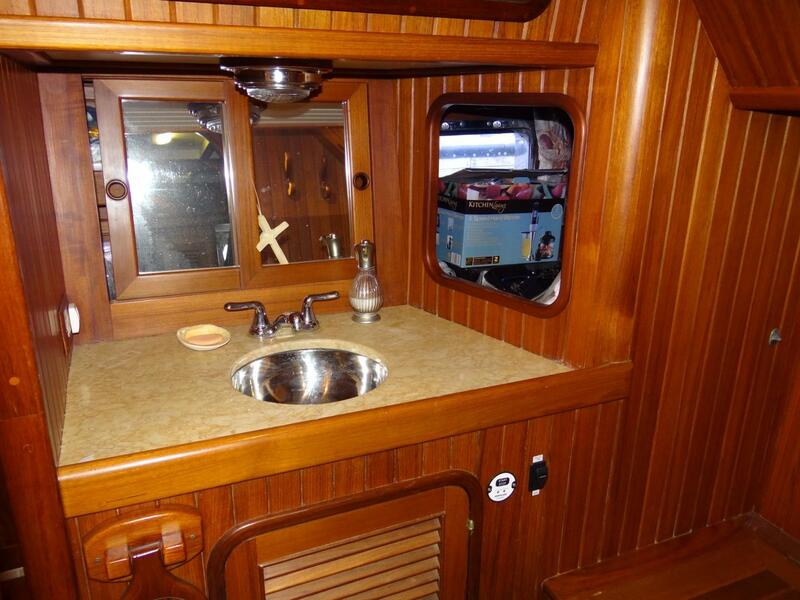 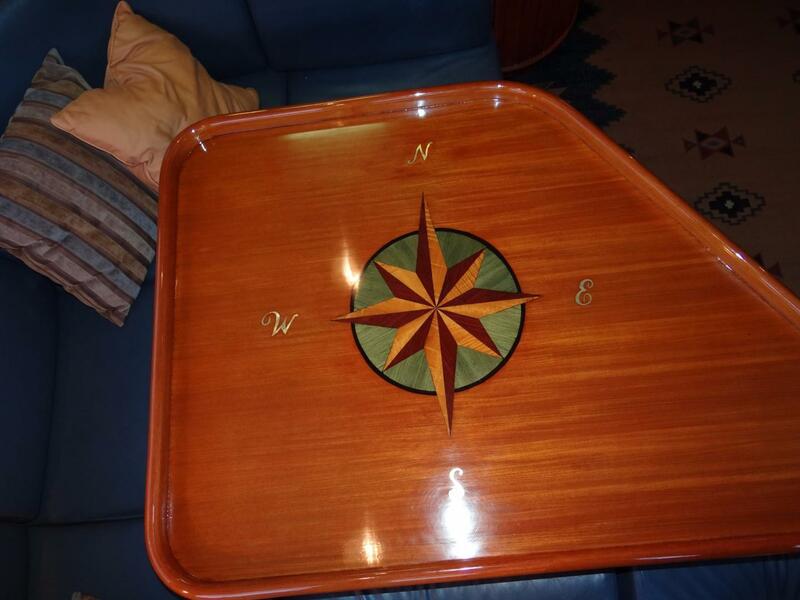 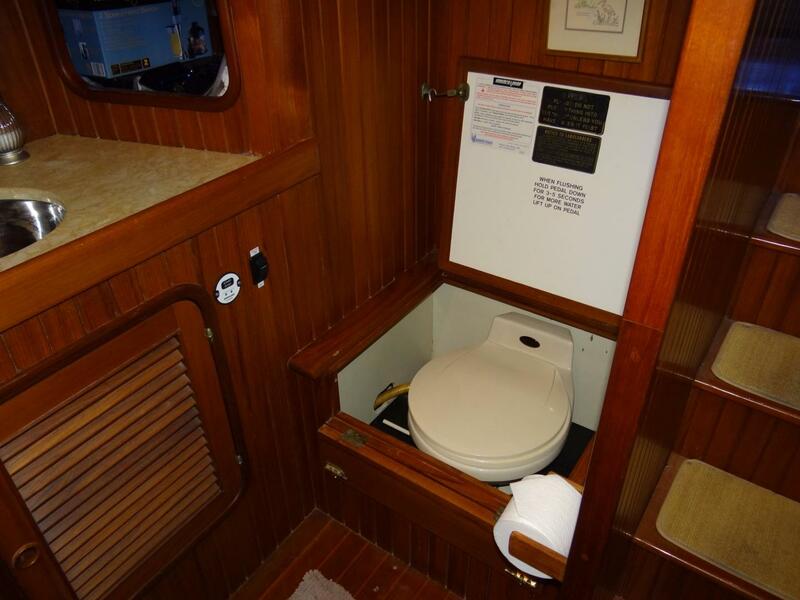 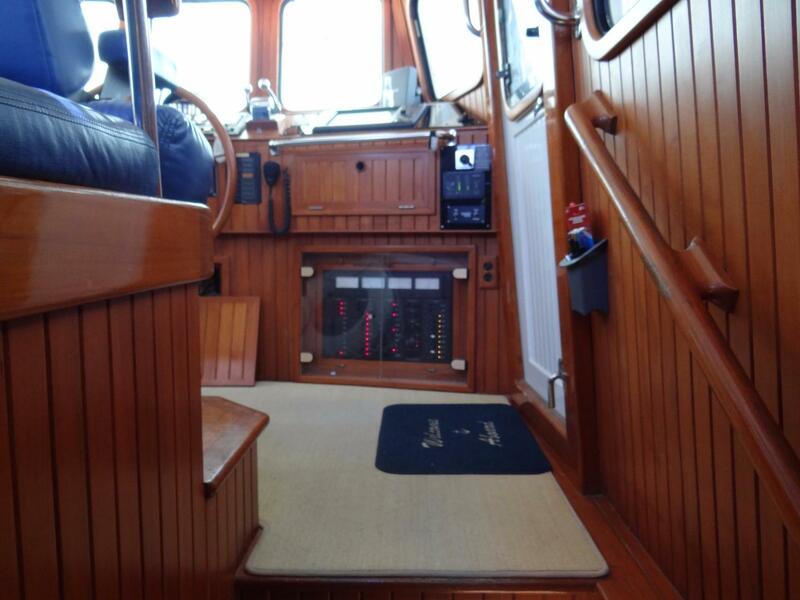 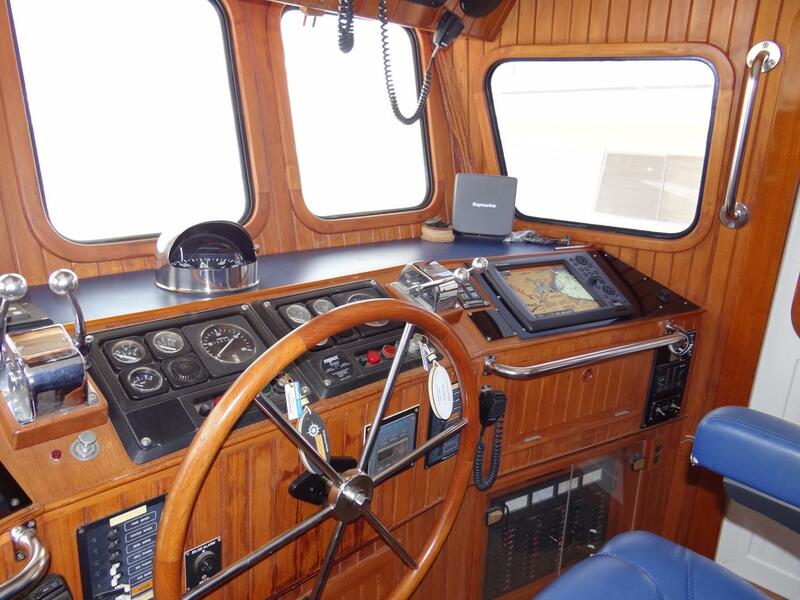 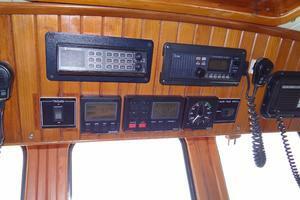 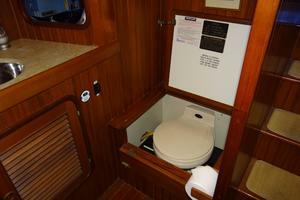 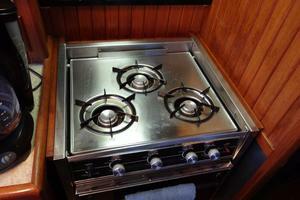 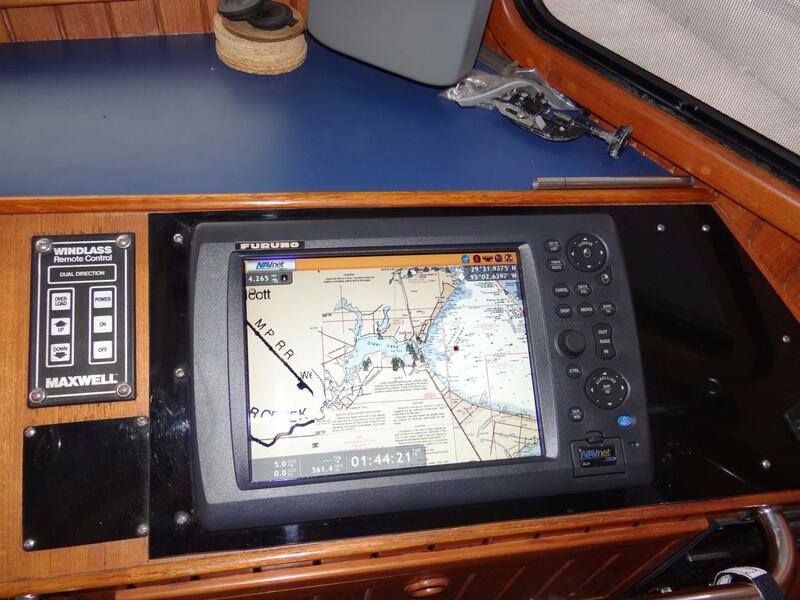 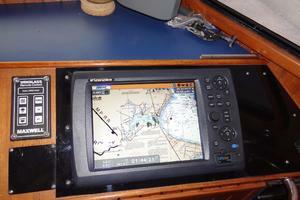 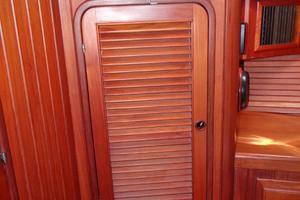 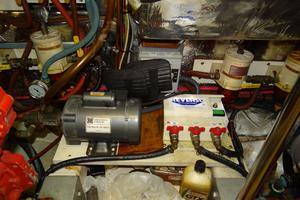 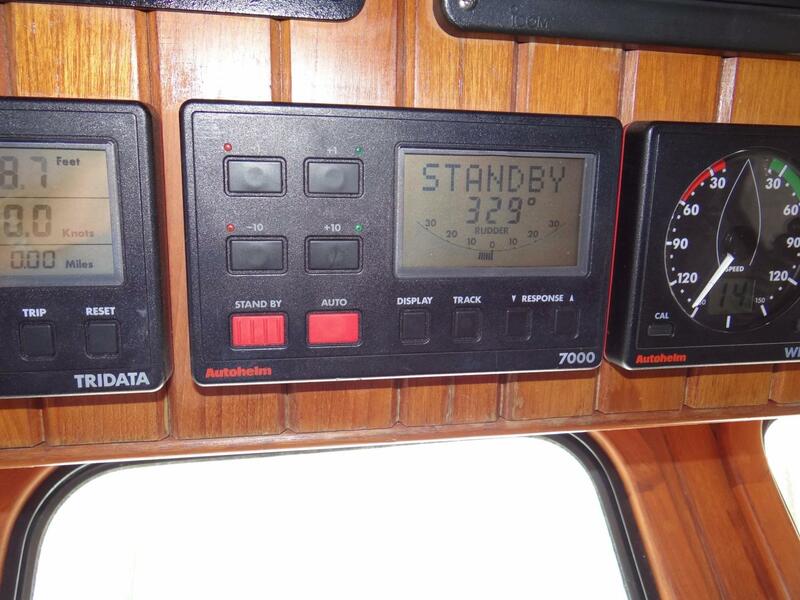 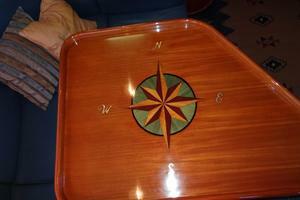 There are built-in storage compartments to port and starboard of the pilothouse. 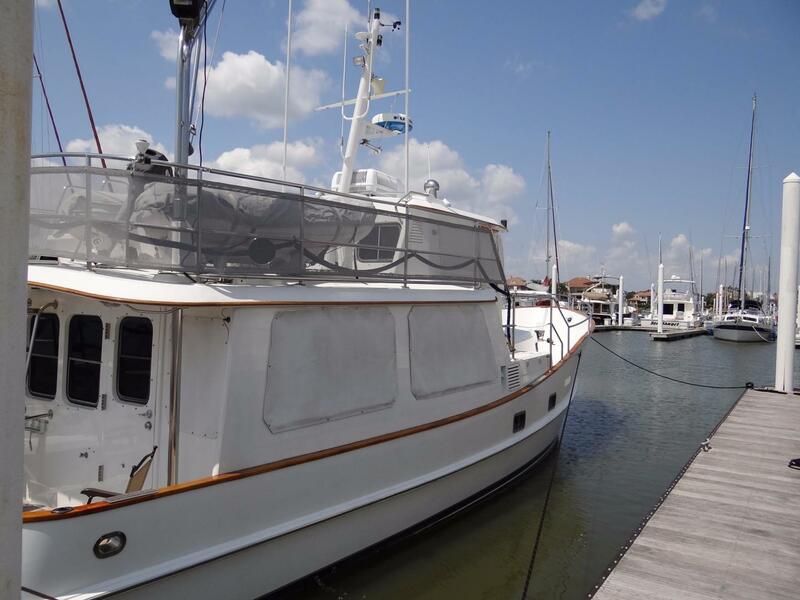 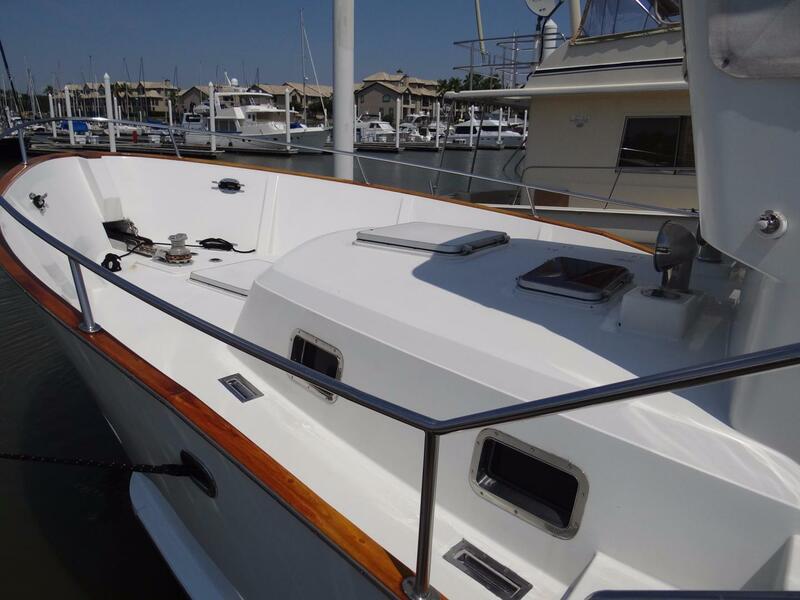 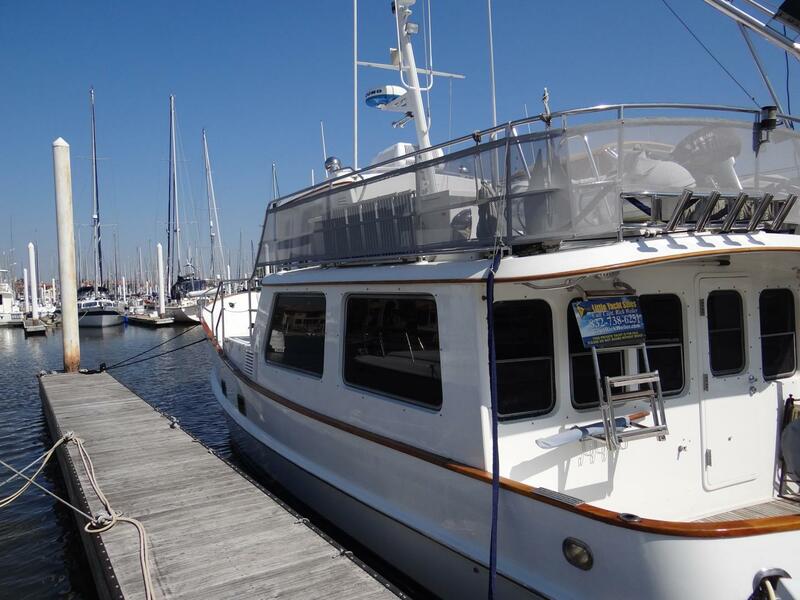 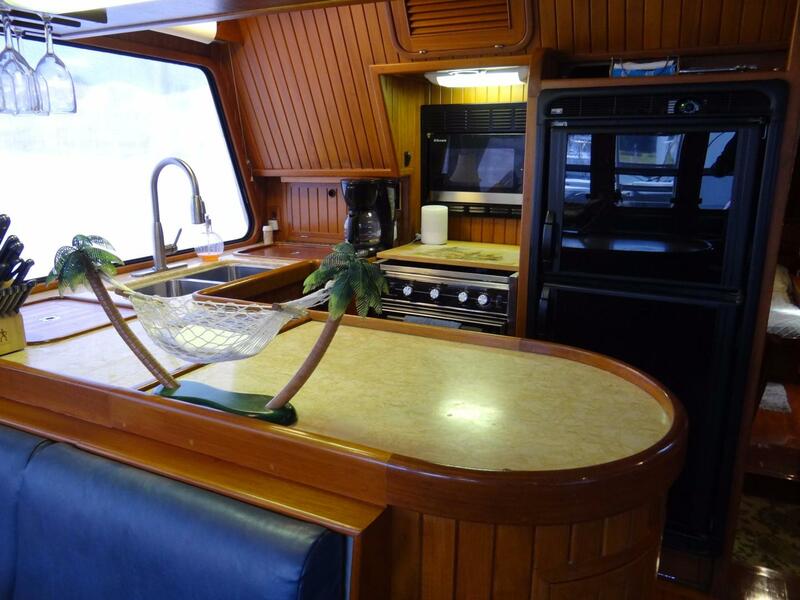 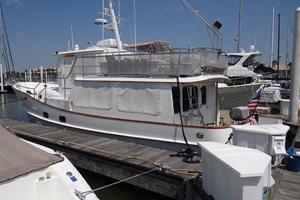 A spacious, covered teak deck is aft and has a ladder to the top deck, a walk-through door to the swim platform, lazarette access, room for chairs and a storage locker to port. 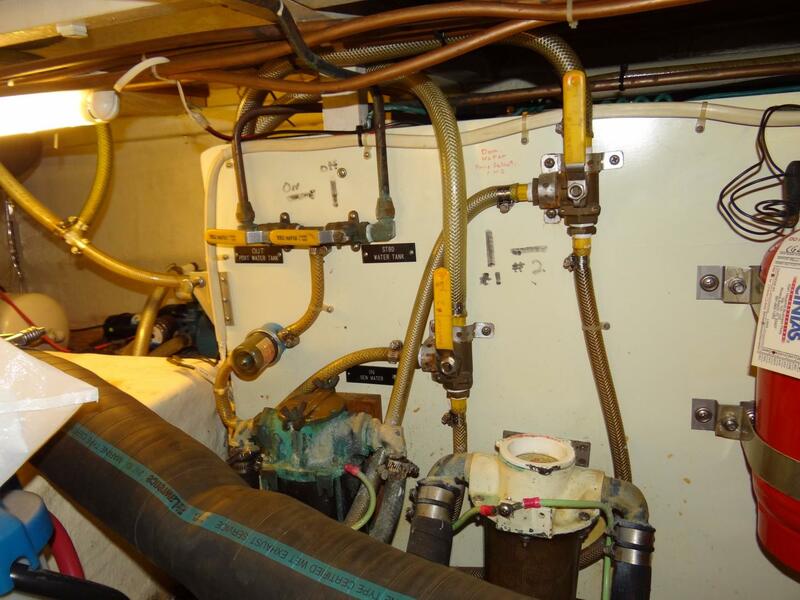 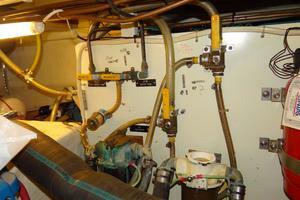 (2) Stainless Steel Potable Water Tanks w/Reported Total Capacity of 300 gal. 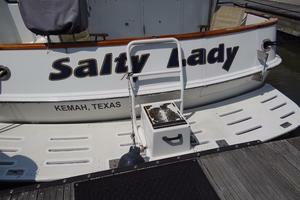 Salty Lady is equipped with dependable twin Ford Lehman diesels that offer excellent economy and dependability. 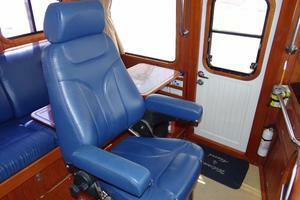 She has been outfitted with only the best mechanical components to make extended cruising safe and comfortable.